If there’s one message many Illinois politicians and civic groups want taxpayers to hear this budget season, it’s that there’s no fixing Illinois’ fiscal and economic mess without a multibillion-dollar tax hike. Tax-hike proponents also want residents to believe the Illinois General Assembly has already passed all the structural reforms it can, and the only thing left to do now is to hike taxes by $7 billion to $9 billion – and that will fix everything. But that narrative is false. The General Assembly has done nothing to stop Illinois’ downward spiral. The Illinois Policy Institute’s 2018 Budget Solutions offers a plan that reverses the state’s failed course. The plan fills Illinois’ $7.1 billion budget hole, balances the state budget without tax hikes, provides tax relief to struggling homeowners through a comprehensive property tax reform package, and implements pension reforms that comply with the Illinois Constitution and will begin to end the pension crisis. It also implements many of the spending and economic reforms Illinoisans instinctively know are needed to create more jobs, generate higher pay and provide a better living environment, including right-sizing state worker benefits, implementing savings for Medicaid and making higher education more affordable for students by reducing administrative costs. Illinoisans are forced to pay the nation’s highest property taxes to prop up Illinois’ 7,000 units of local government – the most in the nation – and the bureaucracies that run them. In some Illinois communities, residents pay 5 percent or more of the value of their home to property taxes. For many, that’s more than they pay toward their mortgage each year. In those places – such as in Chicago’s Southland area – homeowners will pay twice for their homes over a 20-year period: once to purchase their home and a second time in the equivalent amount of property taxes. But property taxes aren’t the only thing fueling excessive local government spending. Billions more in state subsidies help drive local spending on employee perks and other expenses such as the seventh highest workers’ compensation costs in the nation. Many of these costs result from state mandates that only increase costs for taxpayers. Illinois taxpayers deserve relief. That’s why Illinois needs comprehensive property tax reform that includes not just a five-year property tax freeze, but reforms to the state subsidies and mandates that increase local costs. Freeze the property tax levy of every local government in Illinois for five years, including home rule and non-home rule local governments. 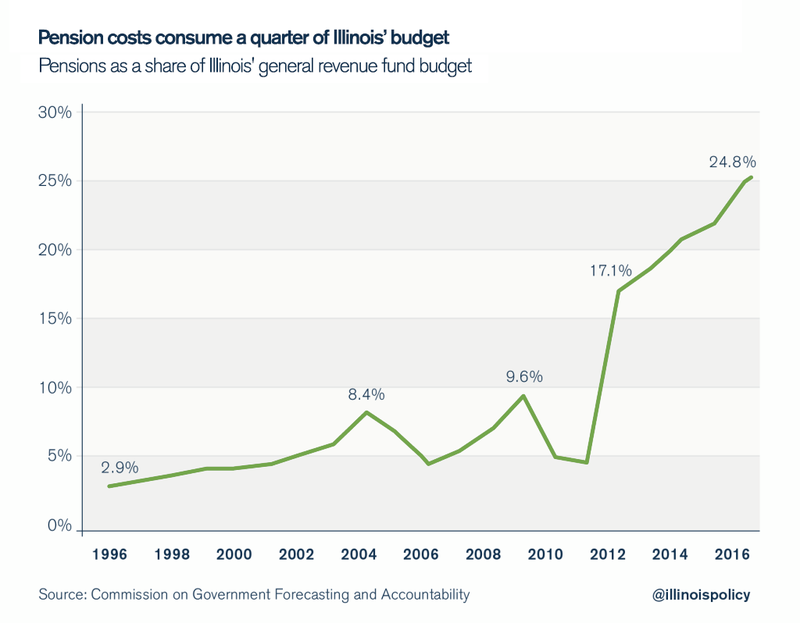 Base the annual increase in local government levies not on inflation, but on Illinoisans’ ability to pay higher taxes. After the five-year freeze, property tax levies will grow based on the annual change in Illinois’ statewide median household income, with a maximum of 2 percent and a minimum of zero. Require a referendum when governments wish to raise other local taxes or fees. To pass, the referendum must be approved by two-thirds of local voters. Freezing property taxes and ending state subsidies won’t be enough to fix Illinoisans’ tax burdens. Local officials must be given greater control over their own budgets so they can reduce the burden on local taxpayers and reform how local government is delivered. Illinois’ pension math simply doesn’t work. It doesn’t work for pensioners, who are worried about their collapsing retirement security. It doesn’t work for younger government workers, who are forced to pay into a pension system that may never pay them benefits. It doesn’t work for taxpayers, who pay more and more each year toward increasingly insolvent pension funds. And it doesn’t work for Illinois’ most vulnerable, who have seen vital services cut to make room for growing pension costs. The status quo cannot continue. 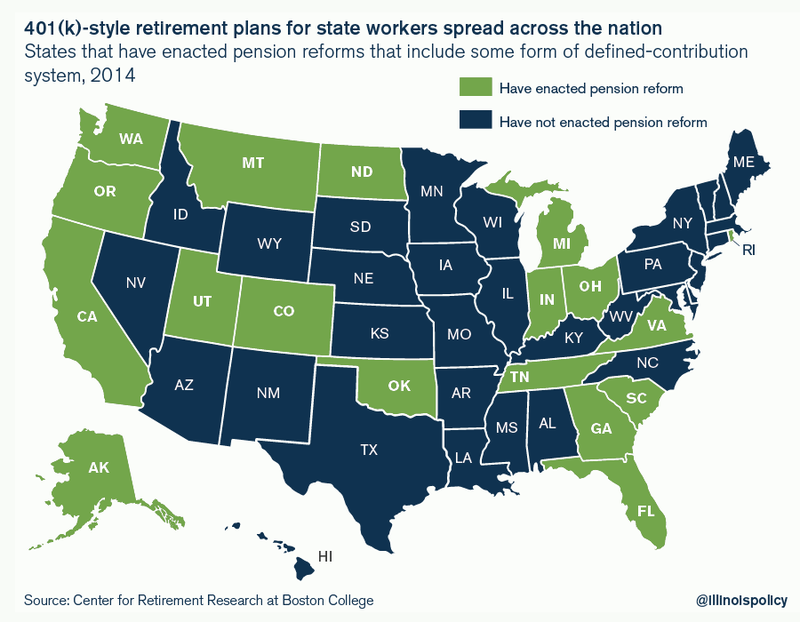 Illinois must follow the lead of the private sector and over a dozen other states, such as Michigan and Oklahoma, and move away from its broken defined-benefit pension system. State worker retirements can be put on a path to financial security by passing a holistic retirement reform plan that complies with the Illinois Constitution and creates a new self managed plan for state workers. Respects the decisions of the Illinois Supreme Court by making changes that do not diminish or impair pension benefits. Enrolls all new workers in a new hybrid self-managed retirement plan, or SMP, based on the State Universities Retirement System’s own SMP. The hybrid plan contains two key elements: an SMP and an optional Social Security-like benefit. Gives all current workers the option to enroll in the SMP. Retirees, and current workers who do not opt in, will be unaffected by the plan. Providing increasingly stable and predictable costs for the state budget going forward. Significantly reducing the growth in accrued liabilities. Ending Illinois’ reliance on its broken pension system by moving virtually every active worker into an SMP by 2047. Eliminating the unfair Tier 2 benefit plan for new workers and allowing existing Tier 2 members to opt in to the new SMP. Sending a strong message to investor and credit agency groups that Illinois is finally tackling its pension crisis. Phases in the costs of any pension funds’ actuarial changes over a five-year period. This will reduce the required $800 million increase in state contributions by nearly $650 million in 2018. Creates a new contribution schedule with a 2018 payment that is $1 billion less than baseline contributions. That will protect overburdened Illinoisans from tax hikes and allow the state to prioritize funding for social services. To achieve the above benefits – including ending unfair Tier 2 pensions – the state must invest the equivalent of $7 billion to $18 billion in today’s dollars over the next 30 years. This is the only pension plan that protects worker benefits under the Illinois Constitution, protects funding for social services, avoids harming Illinoisans with another tax hike, shifts normal costs to local governments to discourage benefit spiking, begins an end to the broken pension system, eliminates the unfair Tier 2 benefit structure, and provides real retirement security to state workers. Illinois’ middle class and blue-collar workers are struggling amid one of the worst economic recoveries in the nation. That pain will only get worse if the costs of state government continue to increase. Illinois taxpayers already have to pay for state workers’ generous benefits, including the highest salaries in the nation, heavily subsidized health care, free retiree health care for most workers and overly generous pension benefits. If the state is able to implement its last, best contract offer to the American Federation of State, County and Municipal Employees, which represents 35,000 state workers, it will save taxpayers hundreds of millions in government overtime and health care costs, among other expenses. In addition, the state can further reform the costs of employee compensation by reducing state payroll by $500 million, or a little more than 10 percent, in 2018. Illinois’ college and university officials blame the state’s budget crisis for the mess in higher education. But budget gridlock isn’t why Illinois’ higher education system is facing financial troubles. Instead, it’s the growing number of administrators and their ballooning costs that make college unaffordable for too many of Illinois’ students, especially those with limited means. Illinois spends more money on administrative and retirement costs than on university operations. In fact, more than 50 percent of Illinois’ $4.1 billion budget for state universities is spent on retirement costs. Colleges and universities must enact reforms to operational spending, reduce the cost of salaries, and eliminate administrative bloat. If they don’t, the destructive cycle of hiking tuition while relying increasingly on state subsidies will continue, making higher education less and less affordable for Illinois’ students. In the meantime, the state cannot continue to subsidize Illinois universities’ bloated administrations and benefits. The Institute’s plan would lower state appropriations to colleges and universities by the equivalent of a little more than 10 percent of projected payroll costs in 2018. Billions in tax hikes on struggling Illinoisans and businesses is not the solution to the state’s budget crisis. The real solution is transforming how Illinois government operates and how it spends taxpayer dollars. Illinoisans know that because they experience the broken nature of Illinois government every day. Seniors who want to stay in their homes after retirement are still being pushed out by the nation’s highest property taxes, in large part because they are forced to pay for too many units of local government and the bloated bureaucracies that run them. Middle-class and blue-collar workers continue to see their manufacturing jobs disappear, a result of the state’s job-killing economic policies. Social service providers, from those who help the developmentally disabled to those who treat drug addiction, are seeing their funding dry up as out-of-control pension costs swallow a quarter of the state budget. Because doctors know the state is a bad partner, many practices do not treat Medicaid patients, and Medicaid recipients still often rely on emergency rooms to access care despite the billions spent on Medicaid. And for too long, Illinois’ college administrators have put themselves before students. Tax hikes won’t solve any of those problems. In fact, they would only perpetuate these crises. The Illinois Policy Institute’s 2018 Budget Solutions offers a plan that reverses the state’s failed course. The plan balances the state budget without tax hikes and implements many of the spending and economic reforms Illinoisans instinctively know are needed to create more jobs, generate higher pay, and provide a better living environment, but that are perpetually avoided by state politicians. Without those reforms, Illinoisans will continue to protect themselves and their futures in the only way they can – by leaving. Illinoisans can’t afford another tax hike. And Illinois can’t afford to further destroy its tax base. Instead, politicians must enact the major spending reforms Illinois needs before they even utter the words “tax increase.” The good news is a full implementation of the Institute’s plan means there wouldn’t be a need for tax hikes. The status quo is robbing Illinois of its future. Years of higher taxes, misplaced priorities and fake reforms have only served to drive people away. Illinois has the people, the assets, the infrastructure and the location to once again be a beacon of prosperity in the Midwest. The Illinois Policy Institute’s Budget Solutions 2018 sets Illinois back on that path. Thus, Illinoisans need comprehensive property tax reform that includes a property tax freeze, as well as reforms to shrink the number, size and cost of local governments and to eliminate the state mandates that increase costs for localities. Only such comprehensive property tax reform will help avoid an income tax hike. Reforms outlined in the Illinois Policy Institute plan would save the state $3.4 billion, which would make up for almost half the state’s $7 billion deficit. Freezing local property taxes is the key to reducing government’s burden on Illinois residents. Illinois’ tangled web of local government is funded not only by steep local property taxes, but also by state subsidies that funnel billions of dollars to local governments every year. State officials like to dole out these subsidies because it grants them greater control over local governments. Local leaders like state subsidies because those funds allow them to spend money without having to bear the political cost of raising taxes locally. That means officials can funnel money where it’s most politically expedient without having to answer to local taxpayers. Ending state subsidies will save state taxpayers billions and force local officials to curb their excessive spending practices. Ending state subsidies and freezing property taxes will have an immediate impact on local communities’ budgets. To enable local governments to operate with reduced revenues, the state must reform many of the mandates – from prevailing wage requirements to collective bargaining rules – that drive up the cost of local government. The high property taxes Illinoisans pay every year help fuel Illinois’ excessive number of local governments, expensive bureaucrats and school district administrations. As a result, property taxes are taking more money than ever out of residents’ wallets, consuming 6.4 percent of Illinoisans’ median household incomes in 2013. That’s nearly double the 3.6 percent property taxes consumed in 1990. In some Illinois communities, residents pay 5 percent or more of the value of their homes in property taxes. For many, that’s more than they pay toward their mortgages each year. In those places – such as in Chicago’s Southland area – a homeowner will pay twice for his or her home over a 20-year period – once to purchase the home and a second time in the equivalent amount of property taxes. Those taxes, and billions more in state subsidies to local governments, fuel wasteful spending, overly generous pension benefits and salaries for too many administrators, as well as unaffordable collective bargaining, prevailing wage and workers’ compensation costs of these thousands of local governments. 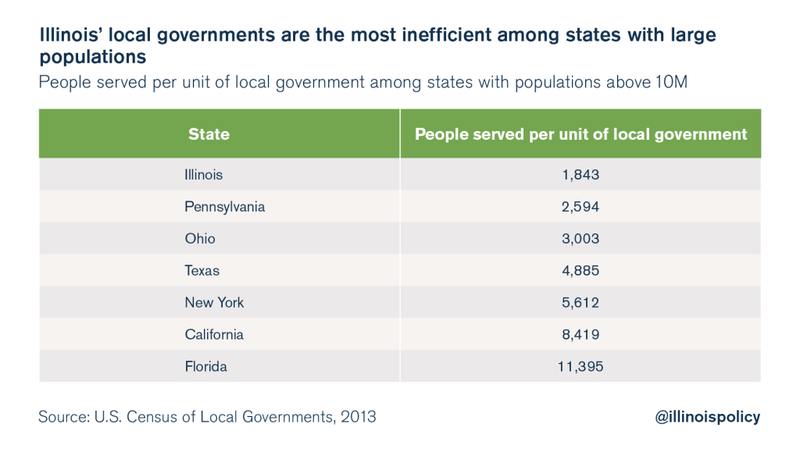 Local governments in other heavily populated states serve far more residents. For example, the average local government in California serves more than 8,000 people, or 4.5 times the number of people as Illinois, while Florida’s local governments serve on average nearly six times as many people as Illinois’ governments do. Illinois’ record number of local governments is a problem due to the inefficiencies they create and the administrative costs they generate. In many communities, multiple government bureaucracies perform functions and deliver services that could be consolidated under a single entity. 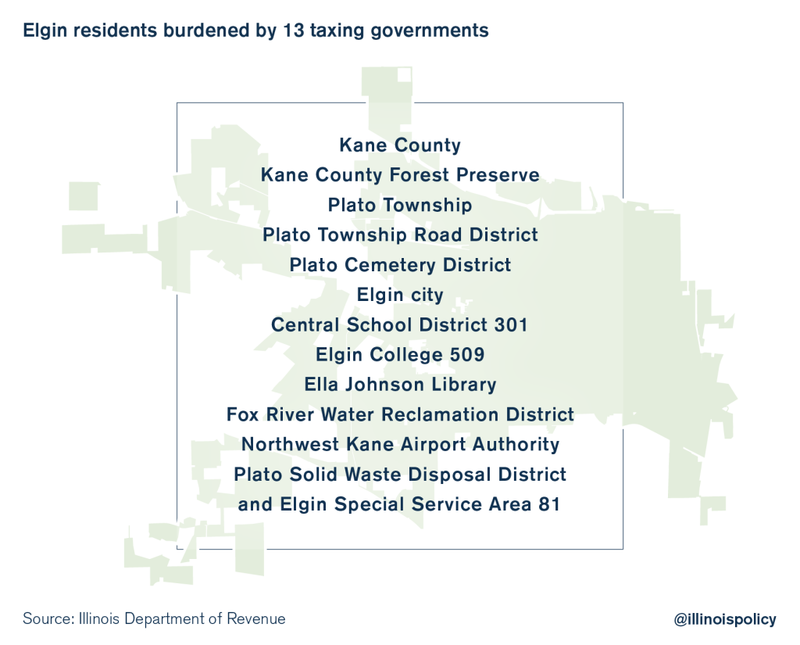 Beyond municipalities, Illinoisans pay property taxes for thousands of additional special districts such as schools, libraries, parks, forest preserves, fire protection, sanitation, transportation and even mosquito abatement districts. These special districts are often unnecessary or redundant, performing functions and providing services that could be consolidated or absorbed by other units of government. Taken together, Illinois’ nearly 7,000 local governments form a vast, complicated web of taxing bodies. Many Illinoisans live under a dozen local governments or more, which makes it difficult for homeowners to hold those governments accountable for the disposition of the property taxes they collect, and the increases in the property taxes they impose. Having thousands of local governments means having to pay for the bureaucrats those governments employ. 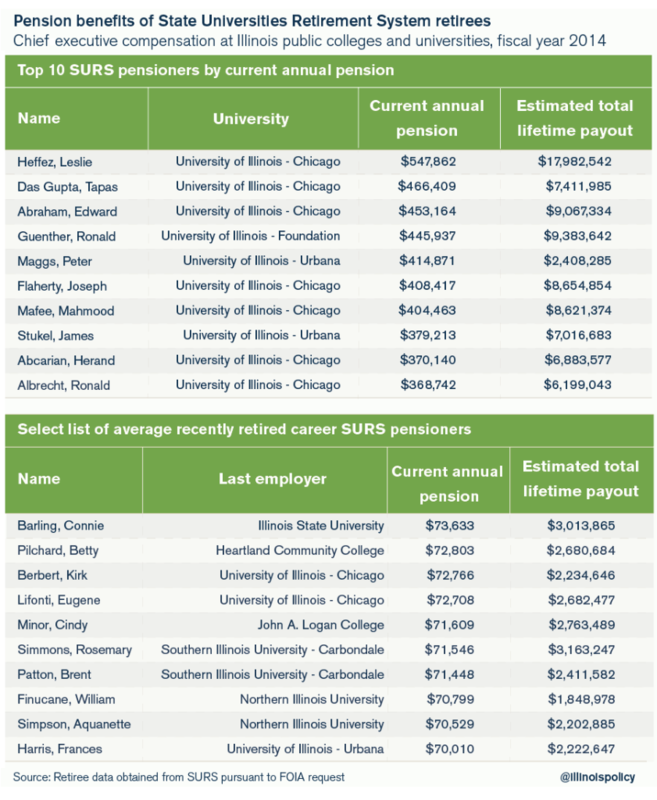 Many localities in Illinois provide high salaries and multimillion-dollar pensions to a significant number of administrators. In most cases, the half-dozen or more local governments in a community will employ a set of administrators – e.g., office managers, human resource directors, computer technicians, etc. – that could each be merged if those local governments consolidated. 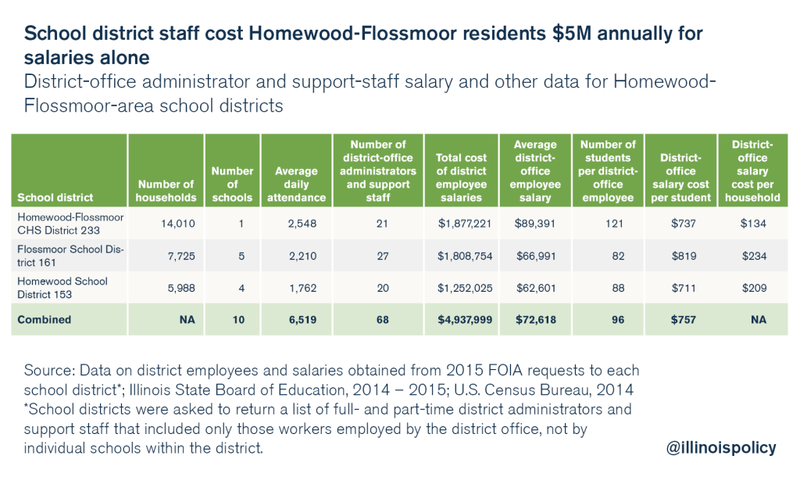 A large portion of Homewood-Flossmoor residents’ property taxes is dedicated to the area’s three school districts – a high school and two nearly coterminous elementary districts. Those districts could be consolidated into one unit district to save on administrative costs. Consolidation of small districts (not of schools themselves) and of districts coterminous with each other could save taxpayers hundreds of millions a year in administrative costs, and billions more in pension costs. Yet Illinoisans across the state continue to pay property taxes to fund district bureaucrats’ generous salaries, benefits and pensions. In sum, the nation’s highest property taxes fund the nation’s highest number of local governments and their costly bureaucracies. Meaningful and lasting tax relief will only come through reforms that reduce the number of Illinois’ nearly 7,000 units of local government, reform government worker salaries and benefits, and lower the costs of local government operations through changes in workers’ compensation, unfunded mandates, collective bargaining and prevailing wages. In the meantime, however, lawmakers can freeze local government tax levies on property (i.e., the total amount of property tax revenues a local government collects annually). The Institute’s tax plan freezes the property tax levy of every local government in Illinois for five years (including home rule and non-home rule local governments). Absent the passage of a local referendum to raise property taxes or the construction of new property, the amount each local government collects in property taxes would be frozen at its current amount. The freeze will help Illinoisans’ incomes catch up with their tax bills and allow more homeowners to stay in their homes. Even with those limits on local government revenue growth, Illinois’ existing property tax cap laws haven’t reduced the tax burden on individual taxpayers. Homeowners across Illinois have seen their property tax bills grow far faster than their incomes. Illinoisans’ future tax bills shouldn’t grow automatically based on inflation. Instead, any growth in future tax bills should be based on Illinoisans’ ability to pay. More closely connecting governments’ property tax growth to homeowners’ ability to pay will mean Illinoisans can better manage their tax bills from year to year. Freezing property taxes will tempt local officials to raise other local taxes and fees instead of enacting reforms. To further protect taxpayers and encourage real reforms, any local governments’ attempts to raise additional revenue through any form of tax or fee should be subject to voter approval. Under the Institute’s plan, any local government that seeks additional revenues must submit its request to taxpayers through a special referendum. To pass, two-thirds of the voters must approve the referendum. Illinoisans pay the nation’s highest property taxes to support one of the most expensive webs of local government bureaucracies in the country. From state income tax subsidies to the payment of local pension costs, state funding helps prop up perks and expenses that would otherwise be unaffordable for local governments. State officials like to dole out these subsidies because that grants them greater control over local governments. Local leaders like the subsidies because the funds allow them to spend money without having to bear the political cost of raising taxes locally. That means officials can funnel money where it’s most politically expedient without having to answer to local taxpayers. That’s why the local bureaucratic tangle burdening taxpayers across the state will only end when its funding sources – property taxes and state subsidies – are reformed. The state subsidies provided to local governments fuel excess spending on everything from workers’ compensation to prevailing wages. Local officials are able to spend recklessly because they know state subsidies will prop up their bad habits. The following are just a few examples of excessive local government benefits and expenses. Local governments use state dollars to provide overgenerous salaries and benefits to avoid conflict with their local government-worker unions – all without having to answer to local taxpayers for the resulting additional costs. 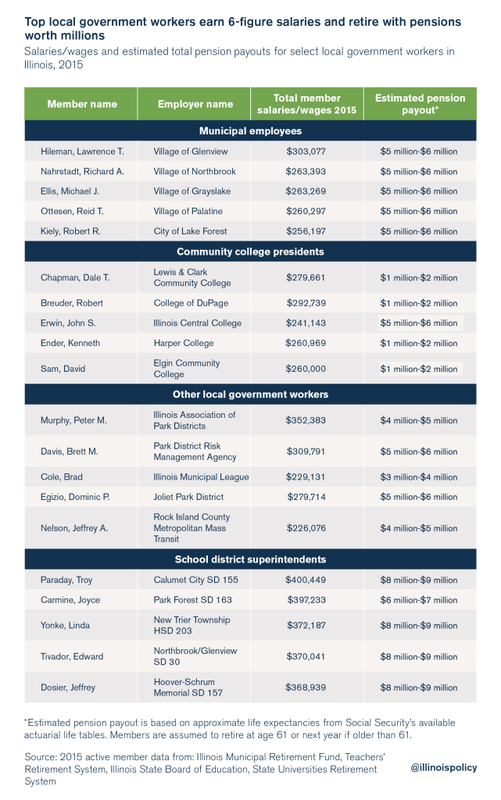 All local governments in Illinois are stuck with a wide variety of employee compensation costs, but Illinois’ 859 school districts illustrate particularly well how state subsidies increase employee compensation. A prime example of how state subsidies affect compensation can be found in the impact of the state paying the cost of teachers’ pensions. 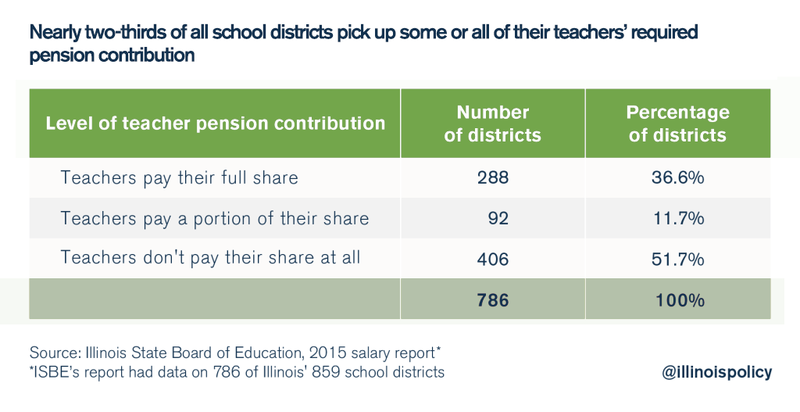 Currently, the state – and therefore taxpayers across Illinois – pays the employer contribution of teachers’ pensions on behalf of school districts outside of Chicago. In doing so, the state is essentially paying for districts’ spending decisions on salaries and pension-boosting perks over which it has no control. Because they don’t bear the cost of pensions, school districts have an incentive to offer pension-boosting benefits to teachers and other district workers, which increases pension costs for all taxpayers in the long run. 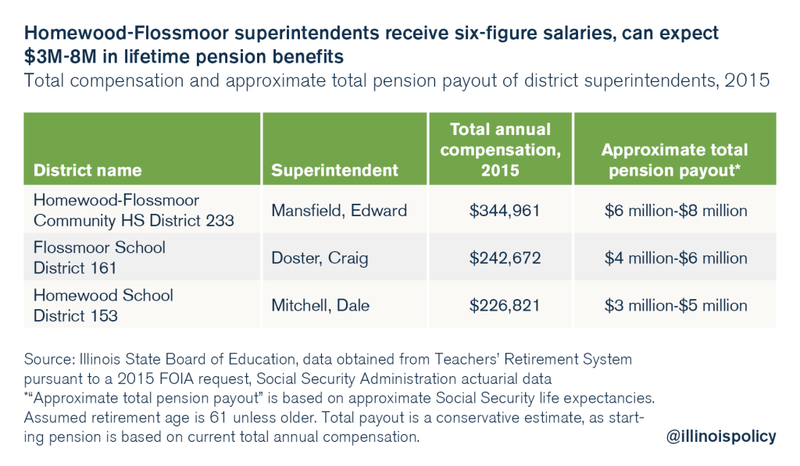 The state’s subsidies of teacher pension costs allow districts to practice pension spiking – end-of-career salary hikes designed to boost future pensions – which increase compensation costs for both state and local taxpayers. Two years of additional service credit can significantly boost a teacher’s total pension benefit. A career teacher who has accumulated two full years of sick leave will on average receive more than $165,000 in additional pension benefits over the course of her retirement. 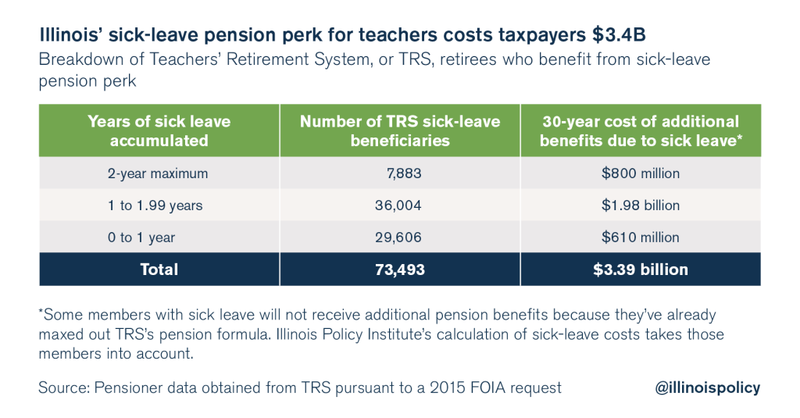 In total, the unpaid sick leave perk costs Illinoisans approximately $100 million a year in additional pension costs – which will amount to nearly $3.4 billion over the next three decades. State subsidies to school districts also encourage the practice of teacher pension pickups. A vast majority of teacher pay isn’t based on merit in Illinois. Instead, it’s based on collectively bargained steps and lanes, a convoluted system that pays all teachers with the same years of work (steps) and education level (lanes) the same salaries, regardless of individual teachers’ skills, effectiveness or achieved outcomes for students. The steps and lanes system can also deceive local taxpayers into thinking their teachers are getting smaller raises than they actually are. Typically, teachers unions and the media report automatic “across the board” annual raises (usually ranging from 2-3 percent) only when a new teachers contract is agreed upon. However, the salary increases individual teachers receive annually are generally much higher than that due to steps and lanes. In 2014, that teacher received a 2 percent automatic annual raise – the raise unions and the media generally referred to. However, the teacher’s total raise was higher than that due to the nature of steps and lanes. By working an extra year, the teacher moved up a “step” and received a total raise of 4 percent – double what was generally reported. And if the teacher earned a master’s degree in 2013, she would also be entitled to move up a “lane” in 2014 as well. In total, she would receive a raise of 11 percent, five times greater than the raise generally reported. Without billions in state aid and the state’s pickup of downstate teacher pension costs, providing such benefits to teachers, from sick leave to step and lane salary increases, would not be affordable for most school districts. The state’s billions in subsidies also fuel additional spending by local governments. Without the billions in extra dollars the state provides to them, local governments could not afford – and therefore would not undertake – the projects that result in these additional expenses. The same heavy costs imposed on private sector employers are also imposed on taxpayers who cover the workers’ compensation costs for local government payrolls, and Illinois’ expensive workers’ compensation system adds billions to the labor costs for public construction projects. A combination of state-imposed prevailing wage rules and state subsidies also drive local governments’ spending higher, especially on local construction and maintenance projects. Under current law, counties have the power to research their own prevailing wage and reconcile it with the (often higher) Department of Labor’s determined wage, but most don’t. Most local governments would rather pay the higher prevailing wages (often with state-provided subsidies) than spend time and resources on determining their own prevailing wage. 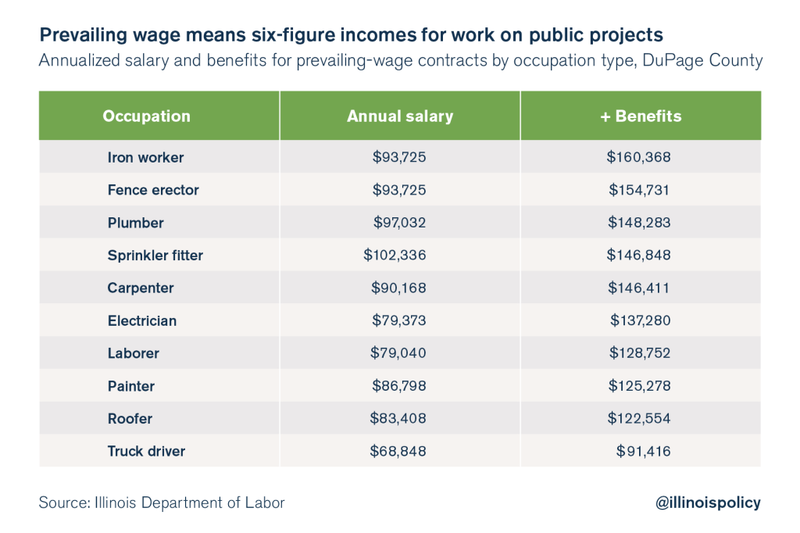 And prevailing-wage workers in DuPage County on average receive even higher compensation when their benefits are included. For example, a fence erector working for the county can expect to receive over $150,000 in annual compensation. The above are only a few examples of the cost of prevailing wages. Many other counties pay excessive prevailing wages they could not afford without the millions they receive in subsidies from the state. Too many state subsidies provide local politicians with the luxury to fund unnecessary local perks and pay for avoidable expenses without having to raise the taxes to pay for them. That means officials can funnel money where it’s most politically expedient without having to answer to local taxpayers. One of the state’s subsidies to local governments is the $1.3 billion Local Government Distributive Fund, or LGDF. The LGDF distributes a portion of state-collected income taxes to local governments each year, not based on need or any particular purpose, but simply on each government’s share of statewide population. Local officials will claim LGDF funds local services and keeps local taxes low. But the facts – the nation’s highest property taxes and the billions spent on perks and duplicative bureaucracies – show the opposite. In addition, the Downstate Transit Fund, which uses state-collected sales taxes to support public transportation in rural areas, and all other state subsidies should be eliminated as well. Taxpayers deserve to stop paying for the excessive local perks and expenses that the LGDF and other funds help pay for. School districts and state universities should be held accountable and responsible for the total cost of compensation for their employees. The responsibility for paying the employer’s pension contribution for teachers and university employees should be shifted back where it belongs – to local school districts and universities. Shifting the cost of pensions will save the state $1.5 billion in annual pension (normal) costs.49 While the state will continue to pay off the teachers’ and state universities’ billions in unfunded pension debt, local school districts and universities would pay for the annual pension costs – the pension benefits their workers accrue for working one additional year – moving forward. The shift will encourage greater fiscal responsibility at the district and university levels. School districts and universities will moderate their employees’ salary and benefits when they have to bear the resulting pension costs. Every year, hundreds of millions in state education funds are carved out for a few school districts whose revenues are affected by local property tax caps and special economic zones. The state cannot afford to give away subsidies to a select few districts when massive budget deficits and pension payments are cutting into funding for classrooms. Illinois lawmakers must eliminate the PTELL adjustment and TIF subsidy to end school districts’ ability to circumvent property tax caps. Enacting a property tax freeze and ending the state subsidy shell games are essential steps of comprehensive property tax reform in Illinois. But those reforms alone won’t be enough to fix the state. Local officials must have greater control over their own budgets so they can lower significant cost drivers and reform how local government is delivered. Unfortunately, the deck has always been stacked against local officials who wish to enact reforms. Many of the laws Springfield lawmakers impose – from collective bargaining rules to prevailing wage requirements and other unfunded mandates – control local governments’ budgets. The problem is the rules of collective bargaining are state-imposed, offering no flexibility to Illinois’ local governments, which are all different sizes, serve different populations, and are operating in different economic climates. The state’s one-size-fits-all rules should not hamstring local governments. Instead, individual local governments should have the right to reform their collective bargaining processes to match their unique economic and budgetary situations. The state must pass collective bargaining reform that empowers local communities to negotiate more affordable contracts. Removing some of the more stringent rules of the collective bargaining process, such as strike protection and forced arbitration, but still requiring compulsory bargaining, would save local governments $1 billion to $2 billion dollars annually. And as with collective bargaining rules, current prevailing wage laws offer little flexibility for local governments. Wages, determined by the Illinois Department of Labor, are set countywide and are usually based on union workers’ compensation. Under current law, counties have the power to research their own prevailing wage and reconcile it with the (often higher) Department of Labor’s determined wage, but most don’t. The difficulty and inconvenience of determining their own prevailing wage causes most counties to simply agree to the often higher prevailing wages the state determines. As a result, local governments that exist in the same county but have vastly different economic and budgetary situations are forced to pay the same amount for construction work. The state should pass prevailing wage reform that allows local governments to determine their own adequate rates of compensation for construction and other contract work. Such reforms could save local governments $280 million annually. Besides the more prominent mandates imposed on local governments – collective bargaining, pension rules, prevailing wage requirements – hundreds of other rules exist that impose significant financial burdens on the local governments that are subject to them. State mandates often force local governments to provide services or fulfill reporting requirements many localities feel are unnecessary and sometimes even counterproductive. They restrict local governments’ ability to adjust to changing budgetary realities. Reforming the hundreds of unfunded mandates the state imposes on local governments will allow local governments to structure themselves in a way that best meets the needs of their budgets, taxpayers and public employees. In addition, state lawmakers should make several changes to the state’s Workers’ Compensation Act, including putting Illinois’ wage-replacement rates in line with those in surrounding states, eliminating the increase in take-home pay for some injured workers, tying medical reimbursement rates to Medicare or group health rates and eliminating the financial incentives for doctors to overprescribe opioids and other dangerous drugs. 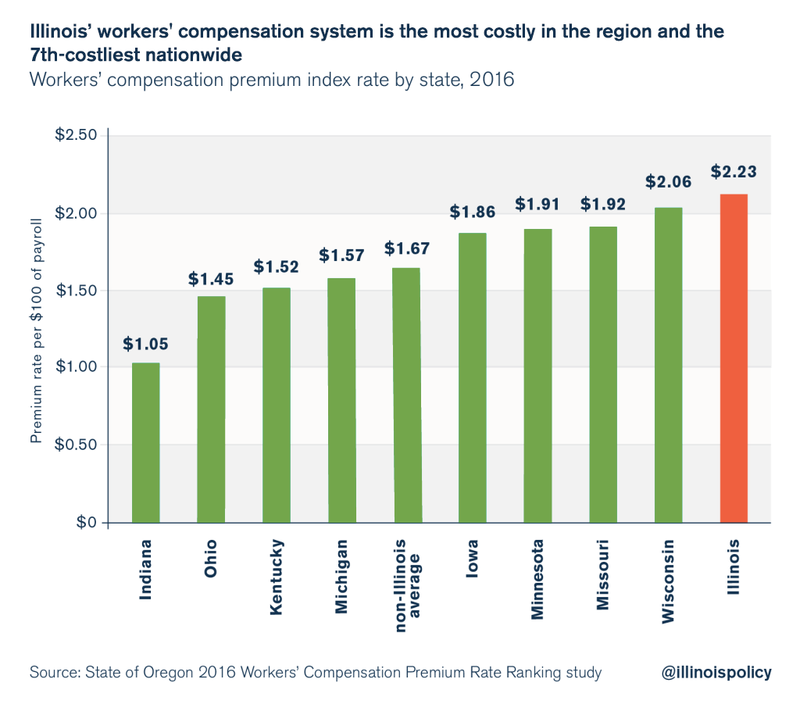 Depending on the changes implemented, workers’ compensation reform could provide Illinois local governments with savings of $200 million per year in payroll costs alone. Illinois’ 7,000 units of local government – the most in the nation – are extremely expensive for taxpayers due to the inefficiencies they create and the administrative costs they generate. In many communities, multiple government bureaucracies perform functions and deliver services that could be consolidated under a single entity. The state should simplify the process to consolidate or eliminate local governments so it is no harder than the process to amend the Illinois Constitution via referendum. Consolidating school districts comes with unique challenges – it is the one type of local government residents are generally unwilling to change. Serious consolidation of the state’s 859 school districts will only happen when the state partners with local districts to provide a cooperative solution. By cutting the state’s school districts in half, local taxpayers could experience operating savings of nearly $130 million to $170 million annually and could conservatively save the state $3 billion to $4 billion in pension costs over the next 30 years. In Illinois, most public school teachers don’t pay their required 9.4 percent employee contributions toward their pensions. Instead, many school districts pick up, as a benefit, some or all of the teachers’ required payments. This means local taxpayers are not only footing the bill for the massive shortfall in the teachers’ pension plan, but also for the individual employee contributions each teacher is supposed to make. Illinois lawmakers should outlaw the practice of pension pickups. Teachers should pay their share of the costs associated with their own retirement benefits. That’s a simple standard across most industries, public and private. Outlawing teacher pension “pickups” would save Illinois school districts about $375 million annually. This leaves officials with fewer options as they balance their budgets and often leaves taxpayers stuck paying higher taxes and fees. This is especially true for local governments struggling with pension debt. Local governments have their hands tied when it comes to pension reform. The Illinois state legislature sets municipal pension laws – retirement ages, cost-of-living adjustments and benefit formulas – with no regard to whether local budgets or taxpayers can afford them. That means local governments can’t reform the largest cost driver in their budgets. And when pensions push local budgets to the brink of collapse, local officials aren’t able to file for bankruptcy to help reorganize debts and relieve stress on both taxpayers and budgets. Local governments should have more control over how they operate. Illinois state lawmakers should pass a law to allow Illinois municipalities the option to file for bankruptcy under Chapter 9 of the U.S. Bankruptcy Code as an option of last resort. Illinois’ pension math simply doesn’t work. It doesn’t work for pensioners, who are worried about their collapsing retirement security. It doesn’t work for younger government workers, who are forced to pay into a pension system that may never pay them benefits. It doesn’t work for taxpayers, who pay more and more each year toward increasingly insolvent pension funds. And it doesn’t work for Illinois’ most vulnerable, who have seen vital services cut to make room for growing pension costs. This crisis is the result of skyrocketing benefits, not underfunding. For thirty years, Illinois politicians changed rules and gave away perks that supercharged promised pension benefits. Today, pension benefits are too unrealistic for state workers to count on and too rich for taxpayers to pay for. It’s no wonder many retirees fear they might lose their pensions. The funds have only 38 cents on hand today for every dollar needed to pay out future benefits – a level that would put private pensions in bankruptcy many times over. Younger workers have even more cause for worry – they may never see a pension. The situation is even worse for those in stuck in Tier 2, the substandard tier of pensions created in 2010. Not only may they never see a pension, but the benefits they’ve been promised will actually be less than what they’re forced to contribute. They effectively subsidize the benefits of older workers. 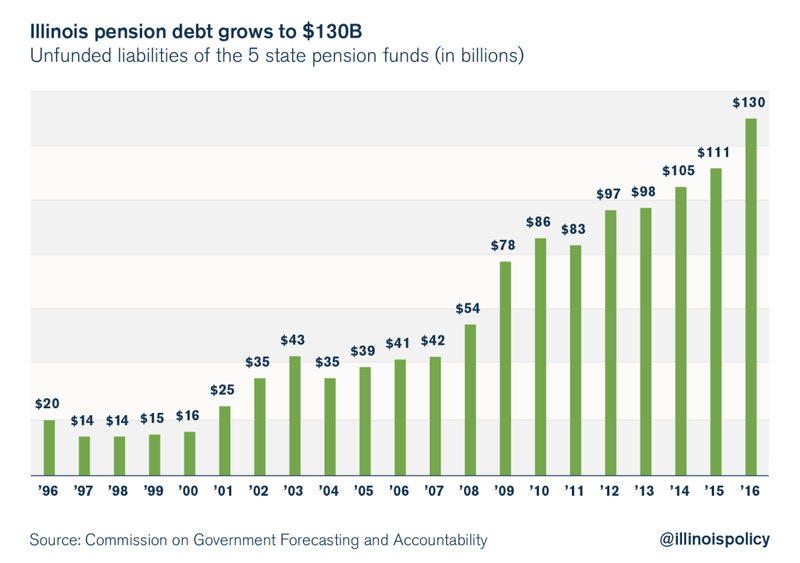 The pension crisis also threatens to punish taxpayers with massive, ever-escalating taxes to bail out an unsustainable system. Twenty years ago pension costs consumed just 3 percent of the budget. Today, one-fourth of the state’s general budget goes to pay for pension costs each year. And the crowding out will only get worse as pension costs continue to grow. The status quo cannot continue. Illinois must move away from its broken pension system and toward self-managed retirement plans that the private sector and many states have already embraced. Critics constantly blame underfunding as the cause of Illinois’ pension crisis. But it’s not. The real pension problem has been the dramatic growth in benefits granted to government workers over the past three decades. Benefit costs have risen so drastically that no amount of taxpayer dollars could have kept up with them. The total benefits owed to workers and retirees (accrued liabilities) have grown nearly 1,000 percent, or nearly 11-fold since 1987. In contrast, the economy has only grown 227 percent; inflation, just 109 percent; and the actual number of participants in the pension systems has grown only 56 percent. The state’s population has increased just 13 percent over that period.6 Pension benefits have grown far faster than any of those factors. If household incomes had grown at the same rate as accrued pension benefits – 9 percent each year – households today would be making nearly $290,000 a year instead of the $60,400 they take in now. Many critics tend to blame underfunding as the cause of the current crisis, but pension assets – the funding source needed to pay out future obligations – have also grown dramatically over the past 30 years. It’s just that they haven’t managed to keep up with skyrocketing benefits. Pension assets grew 627 percent from 1987 to 2015. That’s more than 7 percent per year and also faster than virtually every other metric, with the exception of pension benefits.9 Taxpayers fueled the growth in assets. They contributed nearly $60 billion toward pensions over the last 20 years, $16 billion more than the original 1996 pension reform law called for. 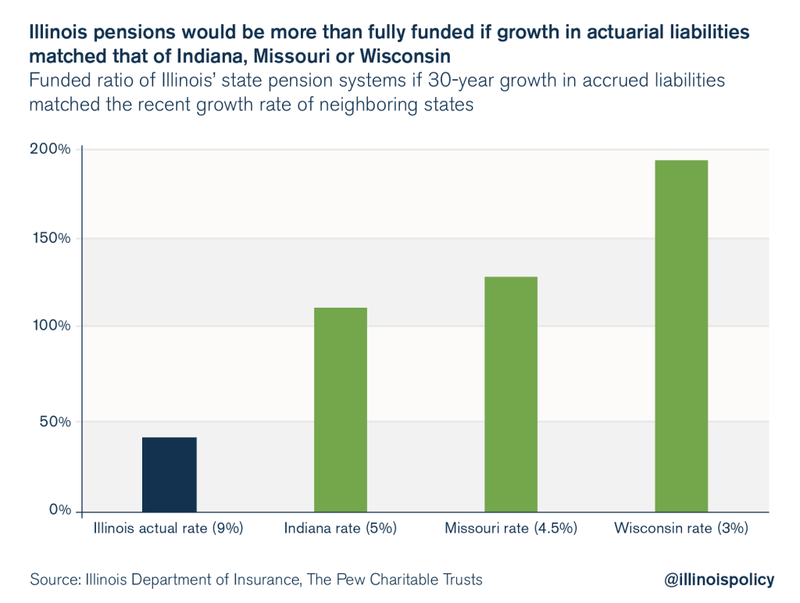 In fact, taxpayers have contributed so much to the system that Illinois would be more than 100 percent funded if accrued pension liabilities had grown at more reasonable rates. For example, if pension benefits had grown at the more recent pace of those in Indiana and Wisconsin, 5 percent and 3 percent, respectively, Illinois pensions today would be more than fully funded.10 At a 5 percent growth rate, Illinois pensions would be 115 percent funded. With 3 percent growth, they would be funded nearly two times over. Promised pension benefits haven’t grown at an average rate of 9 percent a year on their own. They’ve skyrocketed because lawmakers and employers have enhanced pension rules and created additional perks for state workers over the past 30 years. 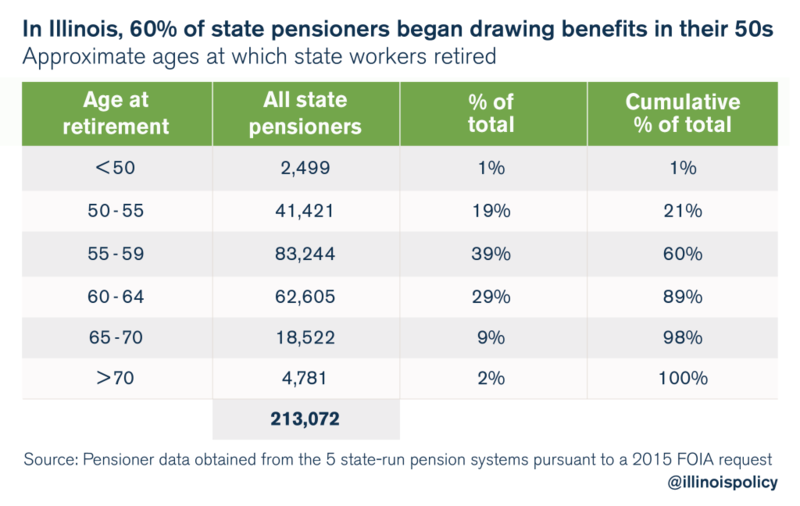 Today, workers’ pension benefits are driven by several major factors: the ability of state workers to retire with full benefits while still in their 50s; automatic 3 percent cost-of-living adjustments that double annual pension benefits after 25 years; and a formula that requires state workers to put in little compared with what they receive in benefits. 60 percent of current state pensioners retired and began drawing pensions in their 50s, many with full benefits. The average pensioner who worked 30 years or more receives $66,800 in annual pension benefits and will collect over $2 million in total benefits over the course of his or her retirement (30 percent of recent retirees are career workers). The average career pensioner will see his or her pension payments double to more than $130,000 in retirement. Career pensioners will get back their employee contributions after just two years in retirement. In all, pensioners’ direct employee contributions will only equal 6 percent of what they will receive in benefits. The bottom line is this: Pension benefits are too unrealistic for state workers to count on and too rich for taxpayers to pay for. Pension benefit promises are bankrupting the very pensions retirees count on for their retirement security. And they are unfairly harming the retirements of younger workers. Politicians desperately needed a new revenue stream to fund the burgeoning pensions of existing workers. They found that stream in the pension contributions of newly hired state workers. State workers hired after Jan. 1, 2011, were required to enroll in a substandard pension plan known as Tier 2. That plan forces workers to contribute more to the pension fund than they will actually get out in retirement. New workers actually lose money when saving for retirement. In contrast, pre-2011 hires also contribute 9 percent of their salaries annually, but the benefits they accrue are worth 22 percent of their annual salary. A loss for newer workers is a subsidy for pre- 2011 workers. 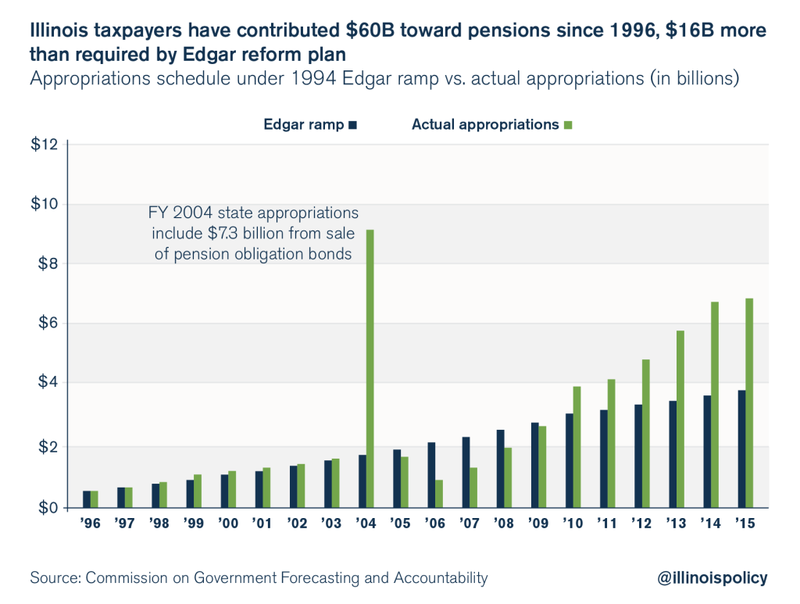 Without that subsidy, Illinois’ pension funds would be collapsing even faster. Unfortunately, the pension system is being propped up on the backs of newer state workers. Newer employees should not be asked to sacrifice their retirements to pay for the mistakes of politicians. Illinois’ pension system doesn’t work: not for retirees who are being deprived of a secure retirement; not for younger workers who are forced to subsidize a broken system; not for taxpayers who are being saddled with unaffordable burdens; and not for Illinois’ vulnerable who depend on the state’s social services. It’s easy to see why. SMP members get to benefit from the current booming market. They don’t have to be concerned about the insolvency of the pension funds. And they don’t have to worry about politicians using workers’ retirement dollars as a slush fund. Illinois must follow in the footsteps of those states and the private sector if it is to end its pension crisis. The Illinois Policy Institute’s holistic, constitutional reform plan puts state worker retirements back on a path to financial security. The plan achieves this by creating a mandatory Tier 3 hybrid SMP for new workers and an optional one for current workers. The plan would reduce – and eventually eliminate – the state’s defined-benefit pension plans. In exchange, state workers would gain true retirement security by controlling and owning their own portable SMPs. Respects the Illinois Supreme Court’s 2015 pension ruling by making changes that do not diminish or impair benefits. Makes retirement security a top priority for state workers by giving them control and ownership over their own portable SMPs. Provides increasingly stable and predictable costs for the state budget going forward. Significantly reduces the growth in accrued liabilities over time. 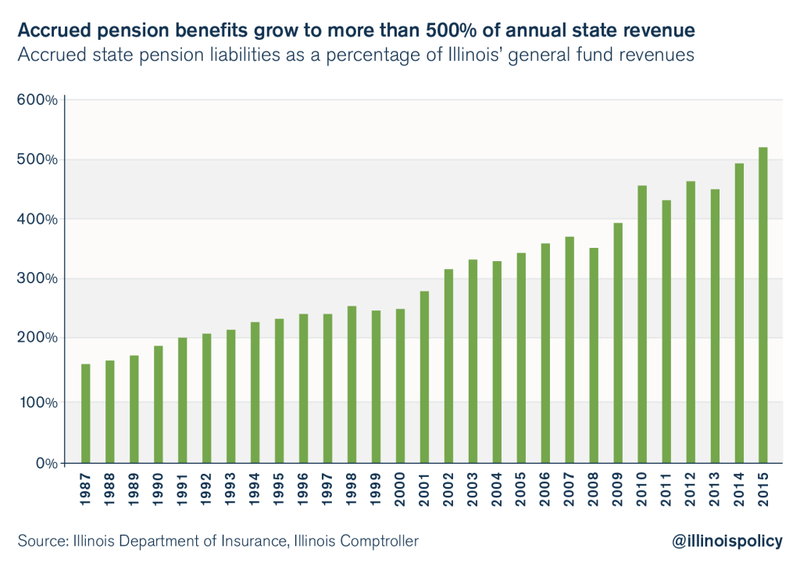 Ends Illinois’ reliance on its broken and nearly bankrupt pension system. Enrolls all new workers in a new hybrid SMP. Gives all current workers the option to enroll in that same plan. Eliminates the unfair Tier 2 benefit plan going forward and allows existing Tier 2 members to opt in to the new SMP. Sends a strong message to the investor and credit agency communities that Illinois is finally tackling its pension crisis. Under the Institute’s pension reform plan, all new workers would be required to enroll in a hybrid SMP, the core of which is based on the State Universities Retirement System’s, or SURS’s, Self-Managed Plan. The hybrid plan contains two key elements: an SMP and an optional, Social Security-like benefit. All current workers are given the option to enroll in the SMP. If they opt in, their already-earned pension benefits are protected. They stop accruing benefits under the pension plan going forward. Current workers who do not opt in to the SMP and current retirees would not be affected by the SMP. The SURS SMP’s nearly 20,000 participants control their own retirement accounts. Under the SURS plan, each employee contributes 8 percent of his or her salary, and the employer contributes an equivalent of 7 percent of the employee’s salary into the employee’s SMP account annually. Participants invest their money with investment service providers that have been chosen by SURS. Under the Institute’s retirement plan, new workers and current workers who opt in would own and control a hybrid SMP that contains two key elements: an SMP based on the SURS model and an optional Social Security-like benefit. The SMP would allow workers access to market returns, while the Social Security-like benefit would provide retirement stability through fixed monthly benefit payments. As with the SURS SMP, state workers would not be allowed to borrow against or withdraw money from their accounts before they retire. The self-managed retirement account would give an employee the opportunity to participate in long-term market returns by investing in a broad range of options vetted by the state. The money in this account would grow over time through accruing employee contributions and investment returns during the employee’s working career. The self-managed retirement accounts would be portable and transferable from job to job. This would allow state workers to change careers and take their retirement savings with them wherever they go. When a state worker reaches retirement age, he or she would begin to withdraw funds from his or her self-managed account to provide income. The remaining assets in the account would continue to grow during retirement. Social Security-like benefit: The other part of the hybrid retirement plan for state workers would consist of an optional Social Security-like benefit. Employers would contribute a matching 7 percent of salary toward their employees’ retirements each pay period. The employer contribution would be used to purchase an annuity-like contract each year from a vetted insurance company. These contracts would provide each employee with a fixed monthly benefit during retirement. Employees would purchase a new annuity-like contract every year. Each additional contract would add to the total fixed monthly benefit an employee would receive during retirement. Like the self-managed portion, the contracts purchased by the employee would be portable and transferable from job to job. When state workers reach retirement age, their annuity-like contracts would begin to provide a steady stream of income annually. Because the contracts provide fixed annual payments, much like Social Security, they would provide workers with a retirement safety net independent of the SMP portion of their plan. If a state worker does not wish to participate in the Social Security-like benefit, the employer’s 7 percent contribution would be deposited into the employee’s self-managed retirement account instead. The Institute’s plan is designed to end the state’s reliance on pensions by moving all new workers into a Tier 3 hybrid SMP. All current workers – from both Tier 1 and Tier 2 – would also have the option to join the SMP. Ideally, all current workers would opt in to the SMP right away. That would immediately freeze the defined-benefit system going forward and would result in an immediate end to the accumulation of future pension benefits. The more likely scenario, however, is that many Tier 1 workers would stay in the current pension plan. Those closer to vesting, for example, have little incentive to leave their current plan. Younger Tier 1 workers and those who have little to nothing vested in the pension plan, however, might choose to move to the SMP. And others, those with less faith that the pension system will be solvent when it’s their turn to get retirement checks, might also opt in to the SMP. In contrast, a vast majority of current Tier 2 workers are likely to join the SMP because of the bad pension plan they’re currently under. For them, an SMP option means getting a real retirement plan. In addition, since Tier 2 was started just six years ago, most Tier 2 workers have yet to vest. Tier 2 requires 10 years before an employee is vested in the pension plan. That also makes Tier 2 workers more likely to convert to the SMP. To determine the total benefits and financial impact of eventually ending pensions, the Institute reform plan was analyzed by Segal Consulting, the actuarial firm used by the state for its annual pension analyses. Segal’s analysis used 2015 data, the most recent data available at the time, and focused on TRS as the proxy for the three major state pension plans. Scenario 1: Assumes all current workers, both Tier 1 and Tier 2, join the SMP. Scenario 2: Assumes only current workers who are members of Tier 2 join the SMP. 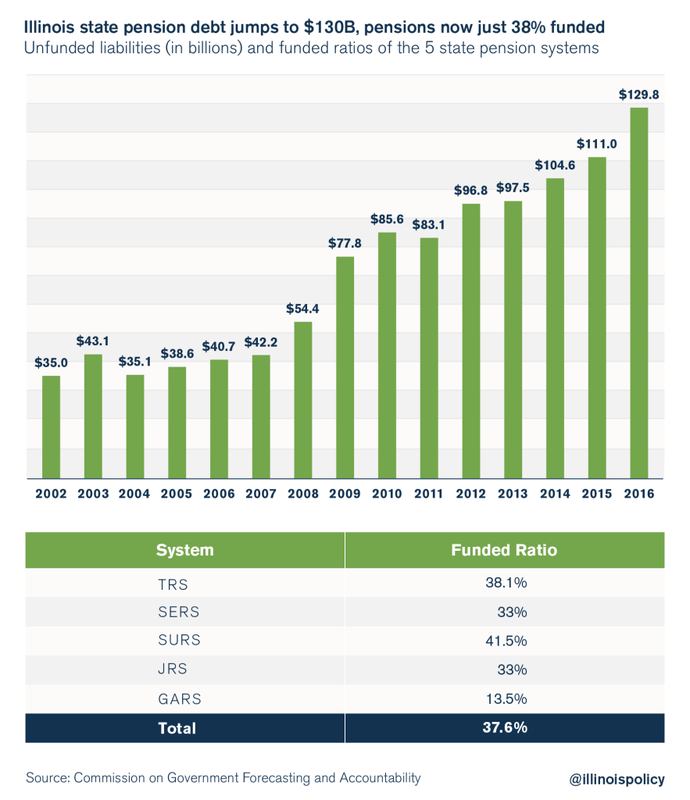 Both scenarios achieve a 90 percent funded ratio for the pension systems within 30 years, just as the current pension systems’ funding projections do. Scenario 1 can be considered the “best case scenario” under the Institute’s SMP. It assumes the unlikely case that all current state workers, in both Tier 1 and Tier 2, will join the optional defined-contribution plan upon its creation. Scenario 2 can be considered the “worst case scenario” under the Institute’s SMP. It assumes that only current Tier 2 workers will join the defined-contribution plan, even though many younger Tier 1 employees are likely to opt in to the plan. Scenarios 1 and 2 serve as the two extremes in terms of the financial results of the Institute’s plan. But for the remainder of this analysis, Scenario 2 will serve as the primary comparison. That’s because the Institute’s plan and analysis work even under the worst case scenario. However, the resulting impact of the SMP improves for every Tier 1 worker who joins the SMP. The reality is participation in the SMP would fall somewhere between Scenarios 1 and 2 (but likely far closer to 2) as some younger Tier 1 workers could be expected to take advantage of the SMP for its portability and access to market returns. The Institute’s plan is designed to reduce the state’s accrued liabilities. 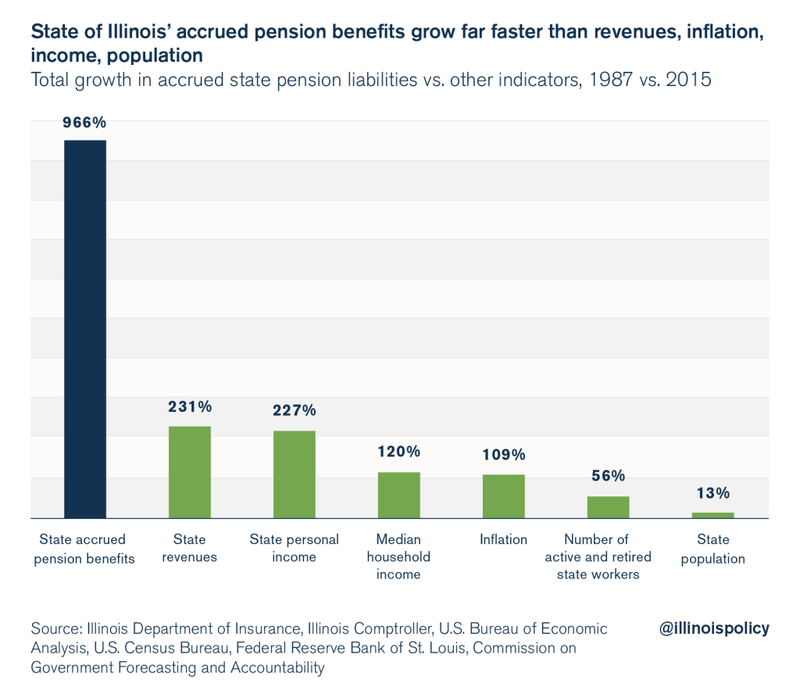 Under the status quo, promised benefits to Illinois workers will grow to over $350 billion by 2047.23 According to Segal’s analysis, the Institute’s plan under Scenario 2 decreases accrued pension liabilities by over 15 percent compared with the status quo (baseline). The reduction under Scenario 1 is even greater. The plan phases out worker participation in pensions. Under Scenario 2, all Tier 2 workers are assumed to switch to the SMP in 2018. Afterward, the proportion of workers paying into the SMP would grow steadily over the years as current workers enrolled in the defined-benefit plan retire and new workers are hired. By 2047, the portion of workers contributing to the defined-benefit plan would be less than 1 percent. Under Scenario 1, all current workers join the SMP upon its creation and the pension plan is frozen immediately. To achieve the above goals – including ending unfair Tier 2 pension benefits – the state must invest the equivalent of $7 billion to $18 billion (likely closer to $18 billion) in today’s dollars over the next 30 years. That amount depends on how many and which tier of workers opt in to the SMP. The more Tier 1 members who opt in, the lower the cost will be. Opponents of SMPs will say the investment needed to implement SMPs and to end the unfair Tier 2 plan is too high. But the costs of staying with the current pension plan are sky-high, and they are on a path to bankrupting the state and state worker retirements. Illinois cannot afford to continue the current pension system. Pension liabilities have grown worse year after year due to failed actuarial assumptions such as investment returns and mortality rates. The state has little to no idea how much more pensions are going to cost in the future. That’s been true for the past 30 years, and there’s no reason to expect anything different in the future. Pension plans are inherently unpredictable and unmanageable. That’s why Illinois’ pension debt has reached record levels despite the billions of extra dollars contributed by taxpayers over the past decade. In contrast, defined-contribution plans are a stable and predictable way to budget for retirement costs. Instead of the growing costs associated with traditional pension plans, defined-contribution retirement plans are a known cost – a fixed percentage of payrolls each year. The state’s SMP employer costs will equal a flat 7 percent of payroll annually under the Institute’s plan. Until Illinois gets politicians completely out of the pension business, the state will never be certain what its retirement costs will be and pensions will continue to crowd out other core services. That’s why moving to the known and manageable costs of a defined-contribution plan is so important. The Institute’s SMP begins to end the state’s pension crisis by slowing down and eventually reversing the accrual of pension benefits (accrued liabilities) for state workers. 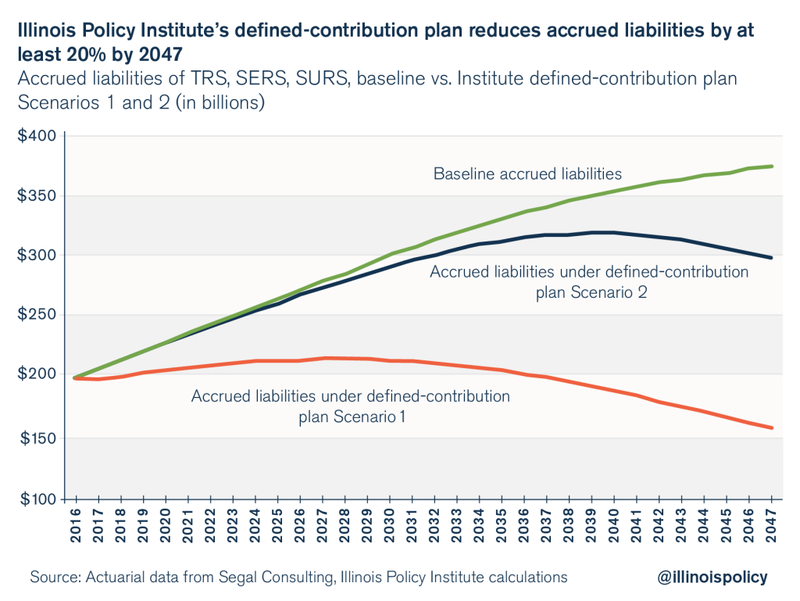 Under the status quo, accrued liabilities for Illinois workers will grow to over $350 billion by 2047.29 According to Segal’s analysis, the Institute’s plan under Scenario 2 decreases liabilities by 21 percent compared with the status quo (baseline). The reduction in accrued liabilities under Scenario 1 is even greater. Liabilities would fall to under $160 billion by 2047, a decrease of 58 percent compared with the baseline. The actual reduction in benefits under the Institute’s plan would fall somewhere between Scenarios 1 and 2, depending on how many Tier 1 current workers chose to enroll in the optional SMP. Given the poor health of the current system, younger government workers, even those in Tier 1, are forced to pay into a pension system that ultimately may not have enough funds to pay them any retirement benefits. Tier 2 members have it even worse. The benefits promised to Tier 2 workers in today’s dollars are actually less than what these workers are required to contribute to the system. This puts Tier 2 workers in even greater danger of never receiving a pension benefit – even though they are subsidizing the pension plans. Creating an optional SMP for current state workers would give them the ability to leave the unfair pension system and control their own retirements. Under Scenario 2 of the defined-contribution plan, all Tier 2 workers are assumed to switch to the SMP in 2018. Afterward, the proportion of workers paying into the SMP would grow steadily over the years as current workers enrolled in the defined-benefit plan retire and new workers are hired. 2030 would mark the halfway point of the transition between the defined-benefit and defined-contribution plans. Over half of all active workers would be enrolled in the SMP by that year. 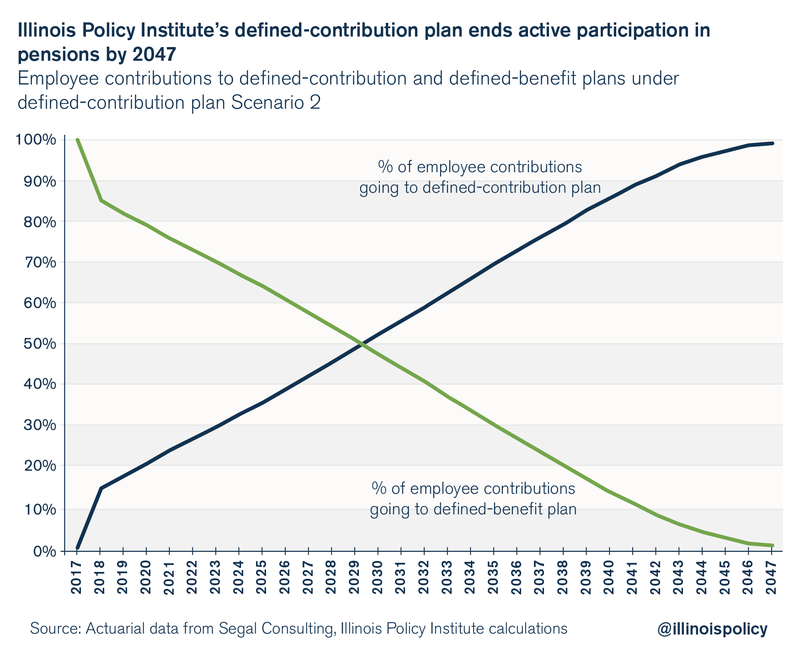 By 2047, the portion of workers contributing to the defined-benefit plan would be less than 1 percent. That means the threat of skyrocketing accrued liability costs would decline significantly as time passes. The defined-benefit plans will end sooner depending on how many Tier 1 workers actually opt in to the SMP. Moving workers to a defined-contribution plan would also end one of the most unfair aspects of the current system: the disparity between Tier 1 and Tier 2 members’ benefits. Tier 2 employees actually provide a net subsidy to the state pension plans. In other words, they are forced to sacrifice their own retirements to compensate for the failure of Illinois’ pensions and the politicians who created the pension crisis.30 Tier 2 is an unfair arrangement that will not last. Either politicians will be pressured to increase Tier 2 benefits or the IRS might force the state to increase benefits in line with the agency’s minimum retirement requirements. Either way, the subsidy provided by Tier 2 members would end and the pension funds’ pension debt would jump dramatically. Illinois should eliminate the unfair Tier 2 system immediately. The Institute’s plan does that by providing all new workers, and all current workers who choose to participate, an SMP. The state’s goal has always been to provide a secure, sustainable and fair retirement to all state workers. Tier 2 pensions don’t provide that. The Institute’s SMP does. The state’s pension crisis has grown despite massive taxpayer contributions and pension bond repayments. Those costs have grown to consume a quarter of the state’s budget, crowding out spending on vital social services for the developmentally disabled, grants for low-income college students and aid to home health care workers, to name just a few programs. To protect spending for those services and protect taxpayers from the harm of another tax hike, the Institute’s plan alters pension costs by $1.65 billion in 2018. Currently, the pension systems have the power to demand billions of additional dollars from the state budget annually by changing their actuarial assumptions. That includes lowering investment assumptions, altering mortality assumptions and other actuarial items. Those changes are based entirely on the funds’ discretion and their impact on the budget is instantaneous, hurting everything from classroom funding to social services. For example, in 2012, TRS lowered its investment rate assumptions to 8 percent from 8.5 percent. That change forced the state to increase its contributions to the pension funds by more than $500 million compared with the projections prior to the change. Assumptions were changed again this year. SERS’s and TRS’s assumption changes will increase the state’s 2018 contributions by $800 million compared with last year’s cost projection for 2018. This setup is simply not fair. Failed assumptions is one of the major reasons why pension costs now consume 25 percent of the state’s budget. And no other institution can automatically carve out billions from the state budget like the pension funds can. Social services and education can’t automatically take billions more from the state if they feel their costs have changed. The impact of actuarial changes on the budget and other programs should not be immediate. Instead, they should be treated in the same way the pension funds treat investment returns. The funds’ investment returns are smoothed over five years to reduce the impact of negative markets on the pension plans’ performance. The same rationale should be applied to changes in actuarial assumptions. Under the Institute’s plan, the costs of any pension funds’ actuarial changes will be phased in over a five-year period. As a result, the projected $800 million increase in state contributions due to changes in actuarial assumptions will fall to $160 million in 2018. The remaining $640 million will be spread over the remaining four years. No other plan does what the Institute’s plan does. It protects worker benefits in accordance with the requirements of the Illinois Constitution while initiating the ending of the broken pension system, eliminating the unfair Tier 2 benefit structure, and providing real retirement security to state workers. And it’s part of an overall plan that avoids tax hikes on Illinoisans and reprioritizes spending on social services. 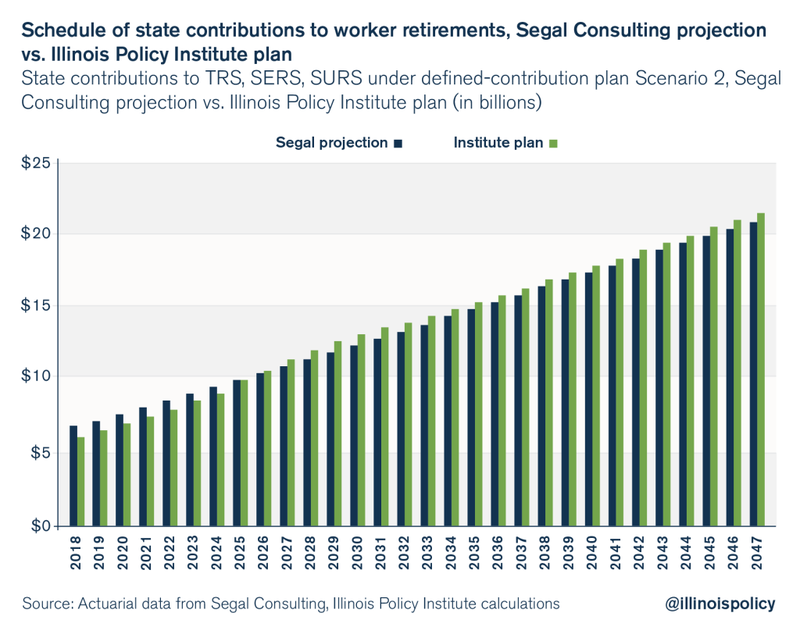 The Institute’s reforms allow the plan to begin with a contribution toward state worker retirements that is $1 billion less than the current pension systems require in 2018.31 Contributions then increase gradually to be in line with Segal’s Scenario 2 projections, which are based on a fixed percentage of payroll. The pension systems will reach 90 percent funded in 2047 under the Institute’s plan. Afterward, state contributions will begin to decline until they reach a constant 7 percent of payroll as designed under the SMP. Illinois’ middle class is struggling in one of the worst-recovering job markets in the nation. The median AFSCME worker salary increased more than 40 percent from 2005 to 2015, to more than $63,660 in 2015. During that same period, median private-sector earnings in Illinois remained virtually flat. Should the union prevail in its demands, the $1 billion in higher wages and $2 billion in other benefit increases would come from Illinois residents who are already overtaxed. If the state is able to implement its last, best contract offer to AFSCME, which represents 35,000 state workers, it will save taxpayers hundreds of millions in government overtime and health care costs, among other expenses. Through contract negotiations with AFSCME, the state is trying to bring union costs in line with what taxpayers can afford. The state’s proposed contract would save taxpayers approximately $600 million dollars in 2018 due to major savings in employee overtime and health care costs, among other items. The state has proposed reasonable overtime provisions that more closely reflect what exists in the private sector – provisions that would save the state approximately $40 million in 2018. The state’s offer does away with the daily computation of overtime and provides instead that overtime kicks in once an employee has worked 40 hours in a week – reflecting what is typical in the private sector and required by federal law. Under the previous contract, AFSCME employees received double-time pay for working on major holidays. Employees received even more – double-and-one-halftimes pay – for “super holidays,” which include Labor Day, Thanksgiving Day and Christmas Day. 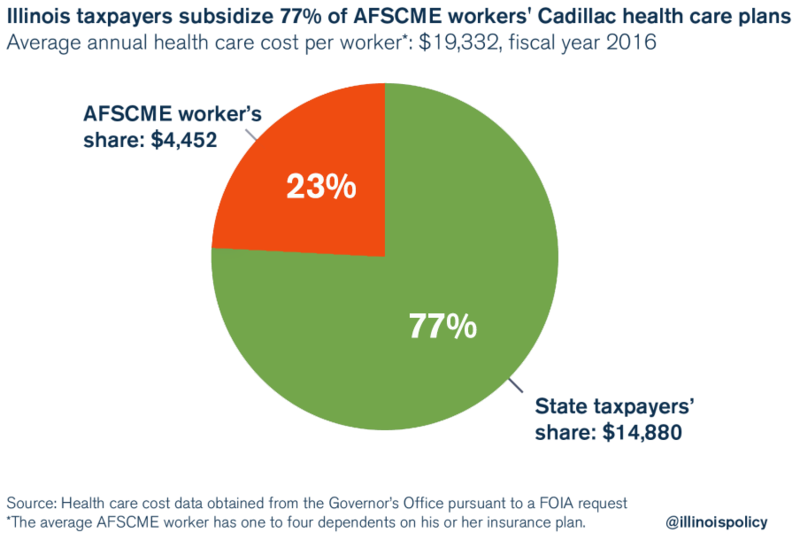 The state’s proposed health care reforms for AFSCME workers would bring their costs more in line with those in the private sector, while still maintaining effective, affordable coverage for state employees. 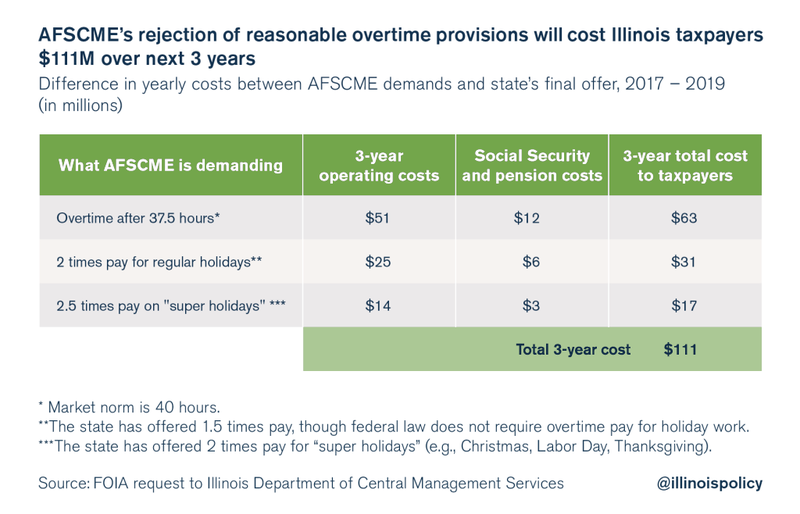 Under the plan, Illinois taxpayers would still subsidize 60 percent of AFSCME workers’ annual health care costs, or over $11,600 per worker annually. Workers would be asked to pay 40 percent of their costs, up from 23 percent under the previous contract. The insurance program would still offer the same medical, dental, life and other insurance coverage as before. The amount of catastrophic protection provided to workers would not change. No matter what health care expenses a worker accumulates, his or her maximum out-of-pocket costs would still equal $6,850 a year. The state’s flexible health care offerings and the implementation of other provisions such as wellness plans, would save taxpayers approximately $500 million in 2018. 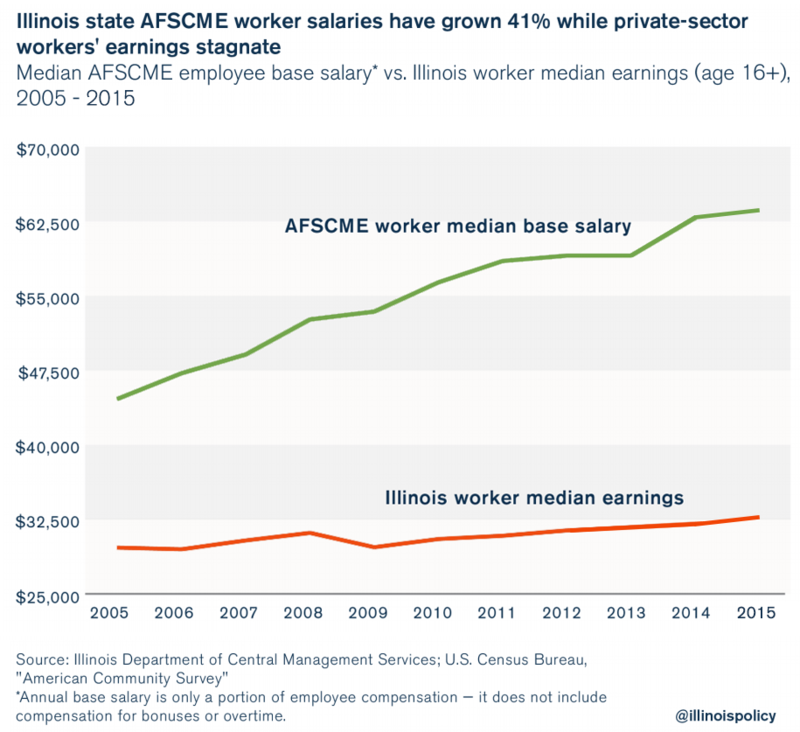 Private-sector Illinoisans struggling with a decade of stagnant wages should not be burdened with the higher payroll costs of state workers who receive the highest salaries in the nation, heavily subsidized health care and other generous benefits. Bringing down the total cost of employee compensation must begin with payroll, as it is the driver of pension costs and other future benefits. Total payroll for state employees will cost $4.5 billion in 2018.17 The state should reform the cost of government by reducing payroll costs by $500 million, or a little over 10 percent, in 2018. As of 2015, enrollment had swelled to 3.2 million – a 135 percent increase. With more than a quarter of all Illinoisans on Medicaid, it is no longer a safety net for Illinois’ neediest residents. Medicaid over-enrollment means Illinois’ most vulnerable are getting crowded out of the care they need. 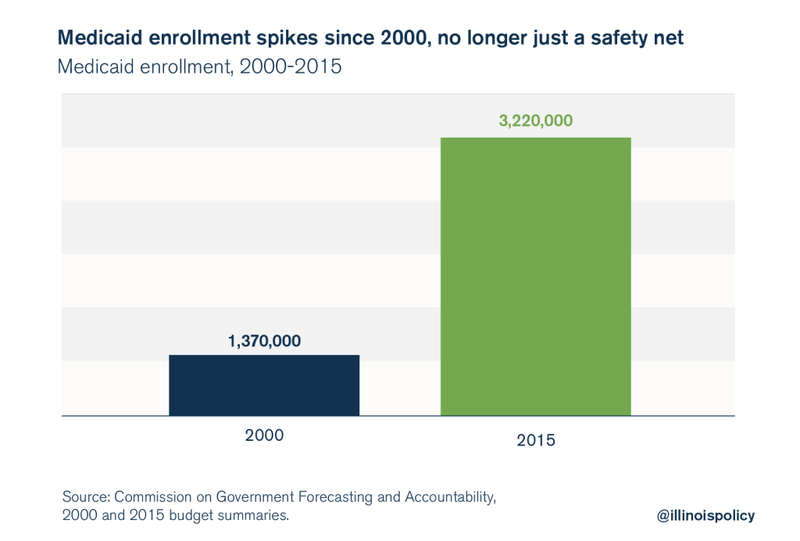 As the number of Medicaid enrollees has increased, costs have too. 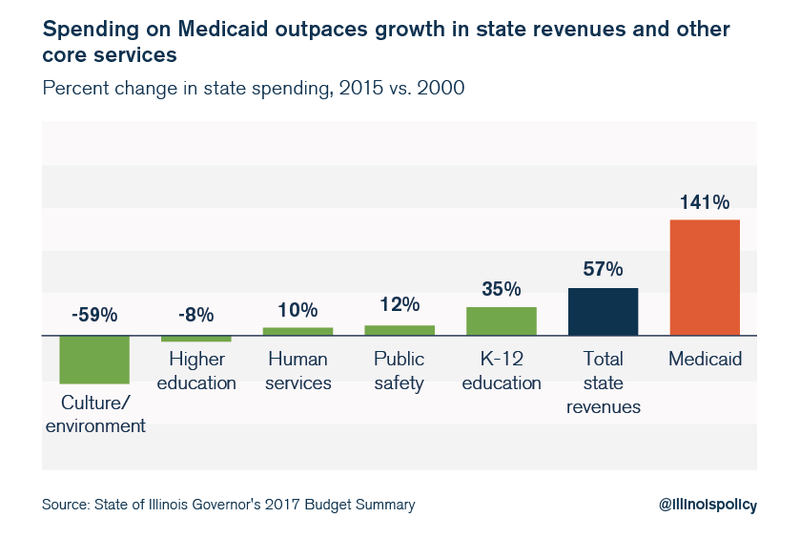 Since 2000, total general revenue fund, or GRF, and GRF-like Medicaid costs have jumped by $7 billion.9 That increase alone is nearly what Illinois state government appropriates for K-12 education each year. Health care costs, largely made up of Medicaid expenses, are projected to consume 25 percent of Illinois’ general fund budget in fiscal year 2017. When compared with spending in 2000, those GRF and GRF-like Medicaid expenditures have grown by 141 percent – far more than the growth in tax revenues and spending on other core services. 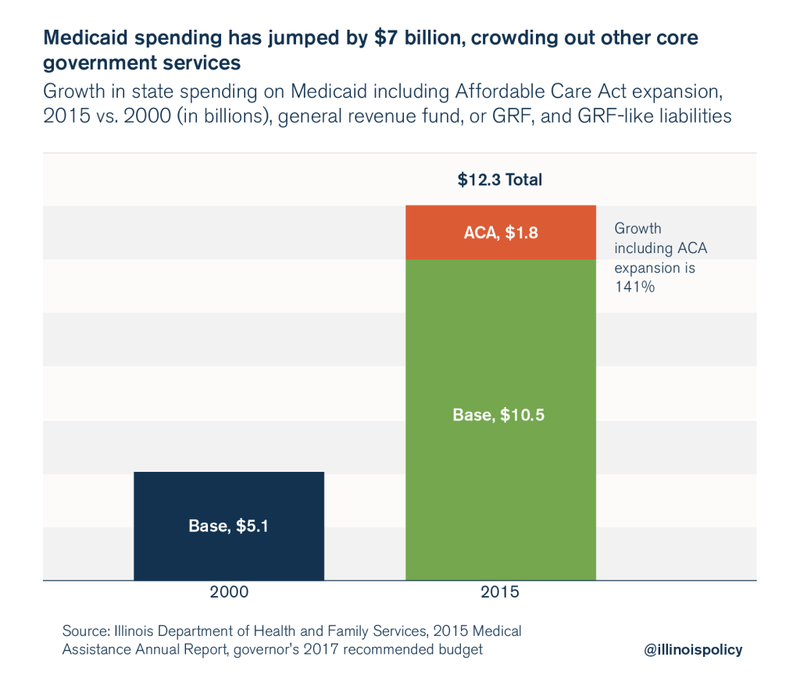 Without serious Medicaid reforms, spending will continue to compromise other programs that help Illinoisans in need. Premium assistance for Illinoisans: With funding secured, Illinois can then transform Medicaid’s fee-for-services and managed care programs into a sliding-scale, premium-assistance program based on need, allowing the state’s most vulnerable residents the opportunity to purchase private health insurance. To make these reforms work, Illinois must also lower costs wherever possible and revisit eligibility requirements to ensure the most vulnerable residents aren’t crowded out of the safety net. The major reforms outlined above involve changes in federal law that may require time to enact. In the meantime, Illinois needs to pursue other improvements that will lower the cost burden of Medicaid. This third party will aggressively manage utilization of pharmaceutical drugs and implement further cost-saving strategies: greater use of generics; prior approval of multiple-agent use; and bringing dispensing fees, ingredient costs, and drug utilization in line with Medicare. Based on spending $1.3 billion on prescription drugs in fiscal year 2016, just a 4.5 percent savings target will reduce costs by $70 million in 2018. Based on the most recent purchasing data, Illinois stands to save as much as $55 million in 2018 by reforming procurement practices. Were Illinois to repeal the recent expansion, the state would save up to $125 million in 2018. But Illinois continues to pay more for these procedures performed in hospitals. The state should lower the rates it pays to hospitals for these common procedures to level the playing field. At lower rates, hospitals will either defer services to ASCs or offer the same procedures at a more competitive rate. These new rates will save Illinois over $30 million each year, based on Illinois’ actual costs in 2015. But budget gridlock isn’t why Illinois’ higher education system is facing financial troubles. Instead, it’s the growing number of administrators and the ballooning costs associated with them that’s making college unaffordable for too many of Illinois’ students, especially those with limited means. Rather than using state-collected taxes to keep tuition low, Illinois colleges and universities have taken an influx of federal and state funding available to higher education over the past two decades and spent it on a massive increase in administrative positions and exorbitant executive compensation. If this trend continues, students with the means will continue to leave Illinois for neighboring state colleges and universities, while lower-income students will increasingly be shut out. Over the past several decades, Illinois’ public colleges and universities have gone on an administrative hiring spree. They’ve grown the size of the higher-education bureaucracy in Illinois while hiking tuition and spending state money to offset the cost. Illinois has followed that pattern. The number of administrators in Illinois’ universities grew by nearly a third (31.1 percent) between 2004 and 2010. At the same time, faculty only increased 1.8 percent, and the number of students only grew 2.3 percent.3 At community colleges in Illinois, the number of administrators grew 13.5 percent while the number of faculty and students grew 6.8 percent and 3.9 percent, respectively. In 1975, the administrator-to-student ratio for higher education institutions nationally was one administrator for every 84 students. By comparison, in Illinois that ratio was approximately 1-to-45 in 2011. 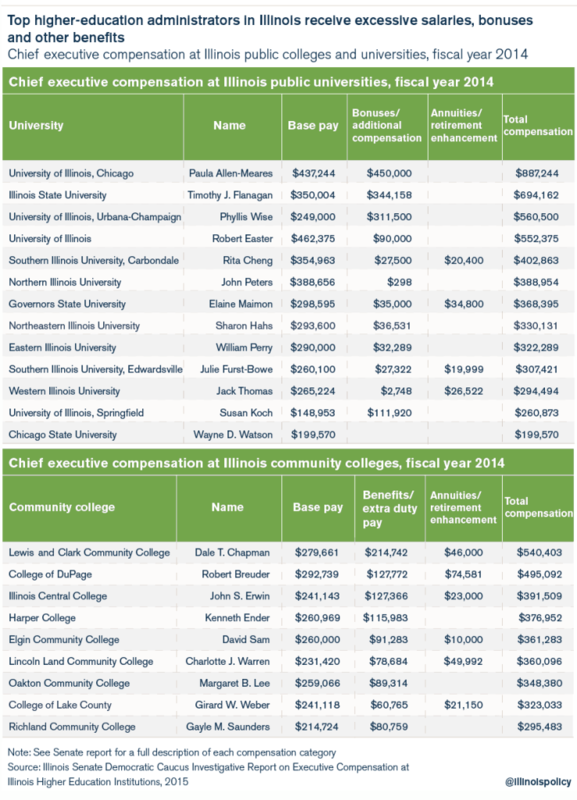 The top-compensated administrator in 2014, the University of Illinois’ Chancellor Paula Allen-Meares, received much of her total compensation in the form of a bonus. Meares received a base salary of $437,244 and a bonus retention incentive of $450,000, bringing her annual compensation to $887,244. Because university retirees’ annual pension benefits are determined in part by their final average salaries, large salary increases, coupled with generous pension rules, have boosted the retirement benefits of university employees far beyond what state taxpayers can afford. Almost half will see their annual pension benefits double over the course of their retirement, based on approximate life expectancies. Over 40 percent will receive more than $1 million in total retirement benefits, and over 7,400 (14 percent) will receive more than $2 million in benefits. The retirement experience of an average, recently retired career university employee (retired since Jan. 1, 2013, with 30 years of service or more) demonstrates how the politician-granted benefits boost retirees’ pensions. For example, Betty Pilchard, a professor who retired from Heartland Community College in 2014 at age 58, received a starting annual pension benefit of $71,551. While administrator costs have skyrocketed, university officials have complained for years about the state’s lack of commitment to higher education, perpetuating a myth that the state’s appropriations have been in steady decline. But state funding has increased by more than 60 percent over the last decade, growing to over $4.1 billion in 2015 from $2.5 billion in 2006.8 Unfortunately, a majority of that money has gone toward administration salaries and retirement costs, not classroom instruction. University officials have effectively shut the door for many of Illinois’ college-bound students through alarming tuition increases to pay for their growing executive salaries and benefits. 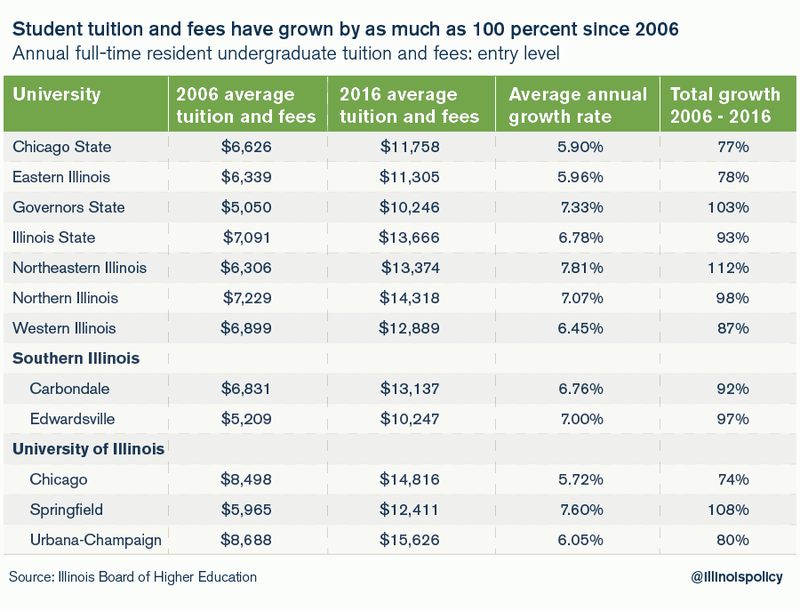 Illinois universities should rely less on state funding because of the tuition they charge. But the opposite is true. This double burden on Illinois families – high tuition paid by parents and students and high state support funded through taxes – cannot continue. 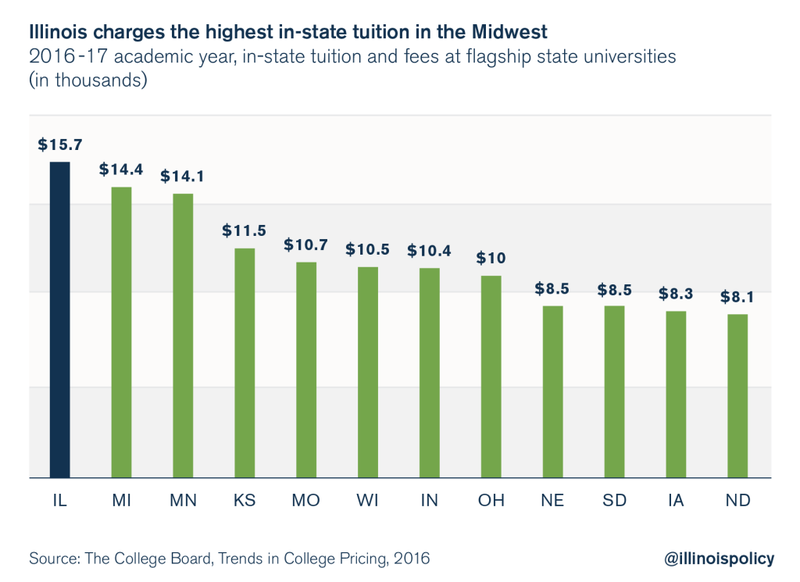 Instead of letting Illinois’ higher education system deteriorate further, Illinois’ colleges and universities must first freeze and then begin to reduce the cost of tuition. They must reform their operational spending, reduce the cost of salaries, and eliminate administrative bloat – then pass the resulting savings on to students. 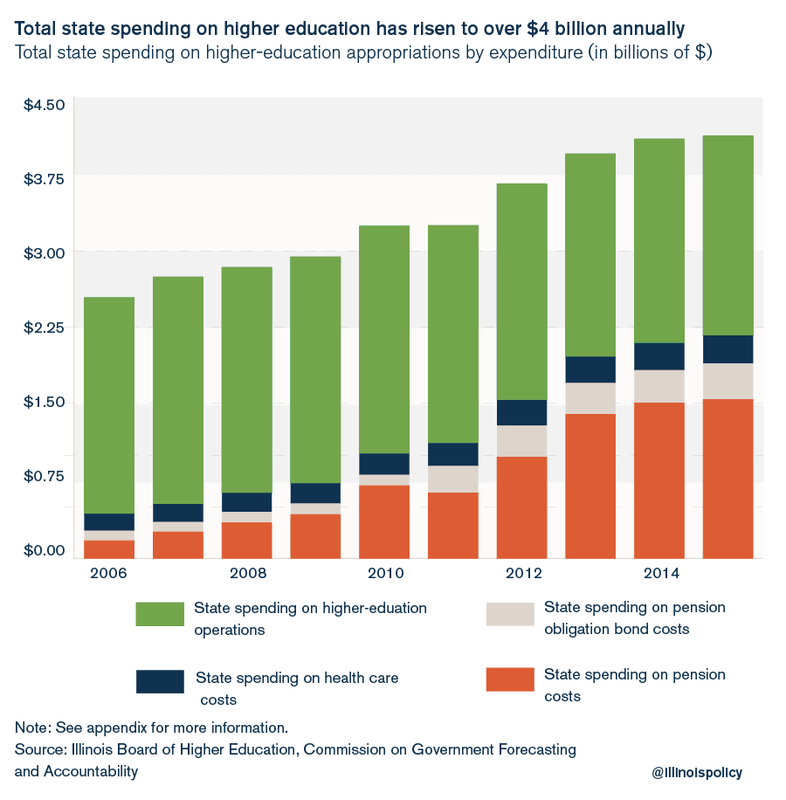 The Institute’s plan calls for a $500 million reduction in state appropriations to colleges and universities – the equivalent of approximately 10 percent of projected payroll costs in 2018.14 Until colleges and universities enact reforms, the destructive circle of hiking tuition while relying increasingly on state subsidies will continue, making higher education less and less affordable for Illinois’ students and more and more expensive for state taxpayers. 1 Michael Lucci, “Illinois Losing 1 Resident Every 5 Minutes to Out-migration,” Illinois Policy Institute, December 23, 2015. 2 Paul Simon Public Policy Institute, Illinois Voters Ask: Should I Stay or Should I Go? (October 2016). 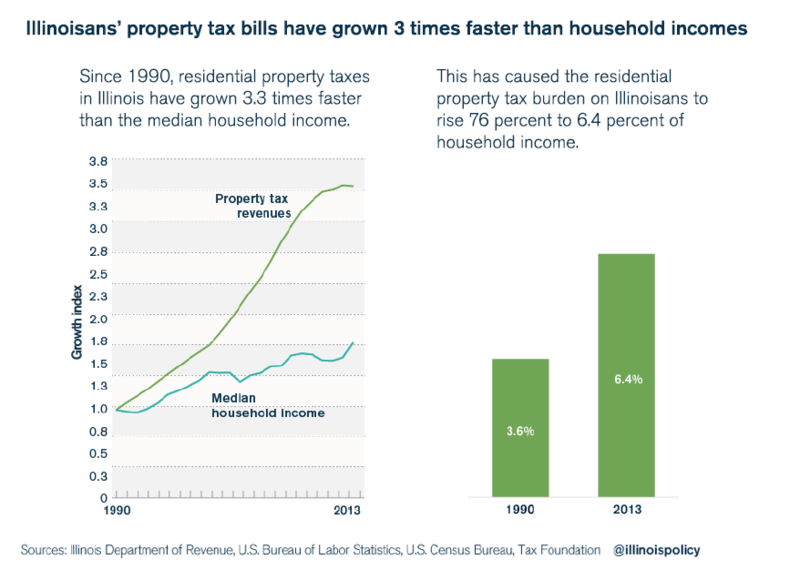 1 Erik Randolph, Ted Dabrowski, and John Klingner, “Growing Out of Control: Property Taxes Put Increasing Burden on Illinois Taxpayers,” Illinois Policy Institute, November 2015. 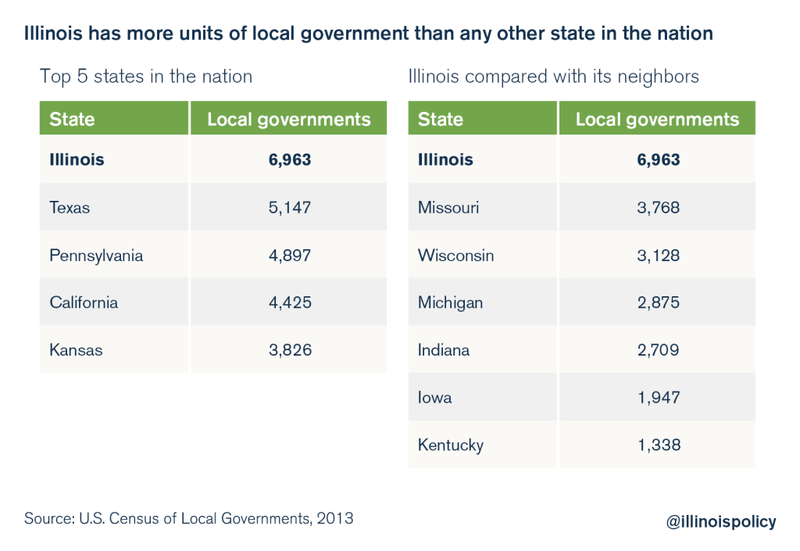 2 Brian Costin, “Too Much Government: Illinois’ Thousands of Local Governments,” Illinois Policy Institute, November 2013. 8 Mindy Ruckman, “Illinois Counties, Cities Should Have the Right to Dissolve Townships,” Illinois Policy Institute, September 21, 2016. 9 Kane County Assessment Office. 10 Ted Dabrowski and John Klingner, “Too Many Districts: Illinois School District Consolidation Provides Path to Increased Efficiency, Lower Taxpayer Burdens,” Illinois Policy Institute, Spring 2016. 11 Ted Dabrowski and John Klingner, “Pensions vs. Higher Education,” Illinois Policy Institute, February 2016. 12 Member compensation data from Illinois Municipal Retirement Fund pursuant to a 2016 FOIA request. 15 Benjamin Scafidi, Ph.D., The School Staffing Surge: Decades of Employment Growth in America’s Public Schools, Part II, (Friedman Foundation for Educational Choice, February 2013). 20 Illinois Comptroller, 2015 Annual Financial Reports: Revenues. 22 Each year the U.S. Census Bureau’s American Community Survey publishes the median household income for every state in the nation. The Institute’s plan would use this single measure to determine the growth in local tax levies across Illinois. 24 Craig Lesner, “Illinois’ Tax Shell Games Mean Taxpayers Can’t Hold Their Governments Accountable,” Illinois Policy Institute, April 26, 2016. 25 Collin Hitt, “Playing Favorites: Education Pension Spending Favors Wealthy, Suburban Schools,” Illinois Policy Institute, May 13, 2012. 26 Ted Dabrowski, Josh Dwyer and John Klingner, “Understanding Illinois’ Broken Education Funding System: A Primer on General State Aid,” Illinois Policy Institute, September 2016. 28 Diane Rado, “School Districts Still Fatten Pensions, Pay Millions in Penalties,” Chicago Tribune, May 22, 2015. 29 Based on Institute calculations and member compensation data from Teachers’ Retirement System pursuant to a 2015 FOIA request. 30 Teachers’ Retirement System, Tier 1 Member Guide, (July 2016). 31 Based on Institute calculations and member compensation data from Teachers’ Retirement System pursuant to a 2015 FOIA request. 32 Ben VanMetre, “64 Percent of Illinois School Districts Pick Up Pension Contributions for Teachers,” Illinois Policy Institute, May 22, 2015. 33 Illinois State Board of Education, 2014-2015 Illinois Teacher Salary Study, (April 2015). 34 Douglas Harris and Tim Sass, “What Makes for a Good Teacher and Who Can Tell?” Urban Institute, August 9, 2010. 35 “North Carolina Budget Ends Master’s Degrees Pay,” Illinois Policy Institute, August 14, 2013. 36 Teachers Contract, Chicago Teachers Union. 37 Illinois State Board of Education, 2014-2015 Illinois Teacher Salary Study, (April 2015). 38 Chris Day, Mike Manley and Jay Dotter, 2016 Oregon Workers’ Compensation Premium Rate Ranking Summary, (Oregon Department of Consumer and Business Services, October 2016). 39 John Byrne, “City Watchdog Calls for Better Control of Settlement Costs for Police Abuse, Workers’ Comp,” Chicago Tribune, June 30, 2016. 40 Dan Moran, “Mayor: Workers’ Comp ‘Epidemic’ Cost Waukegan Nearly $1M in February,” Lake County News-Sun, April 3, 2015. 41 Michael Lucci and Mindy Ruckman, “Workers’ Compensation for State, County and Municipal Workers Costs Illinois Taxpayers $400 Million Per Year,” Illinois Policy Institute, Winter 2016. 42 Bobby Shaw, “Prevailing Wage Gives 6-Figure Salaries to Workers on Public Projects in DuPage County,” Illinois Policy Institute, June 9, 2015. 43 Anderson Economic Group, The Impact of Michigan’s Prevailing Wage Law on Education Construction Expenditures, (September 17, 2015). 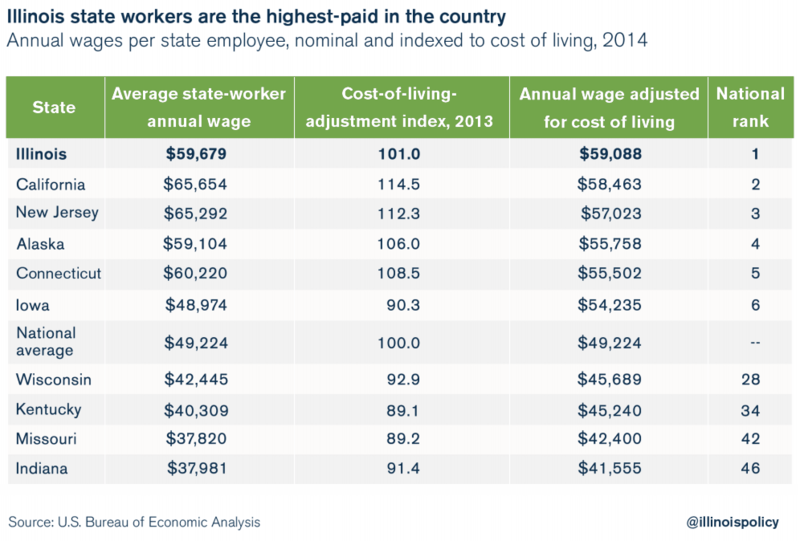 45 U.S. Census Bureau, “Median Workers’ Earnings,” American Community Survey 2015. 46 Illinois Comptroller, 2015 Annual Financial Reports: Revenues. 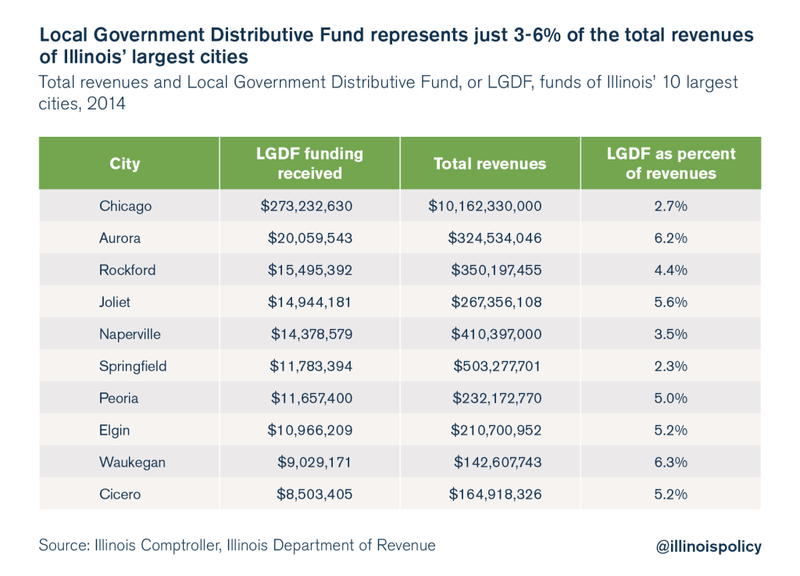 47 There are over 900 municipalities with populations below 5,000 that rely heavily on LDGF funds as a percentage of their budget when compared with larger municipalities in Illinois. Those communities collectively receive a little under $100 million from LGDF annually. As those communities do not have the tax base of larger municipalities and cannot cope as easily with the loss of LGDF dollars, they are exempted from the Institute’s cuts to LGDF in 2018. 49 Teachers’ Retirement System, Teachers’ Retirement System Actuarial Report 2016, (2016). ; State Universities Retirement System, Actuarial Valuation Report 2015, (2015). 51 Geoffrey Lawrence, James Sherk, Kevin D. Dayaratna, PhD, and Cameron Belt, How Government Unions Affect State and Local Finances: An Empirical 50-State Review, (The Heritage Foundation, Institute for Economic Freedom and Opportunity, Special Report, April 11, 2016). 52 Anderson Economic Group, The Impact of Michigan’s Prevailing Wage Law on Education Construction Expenditures, (September 17, 2015). 53 Task Force on Local Government Consolidation and Unfunded Mandates, Delivering Efficient, Effective and Streamlined Government to Illinois Taxpayers, (December 17, 2015). 54 Mark Fitton, “Rauner Backs Plan to Eliminate Unfunded School Mandates,” Illinois Policy Institute, February 20, 2016. 59 Hilary Gowins, “Illinois House Passes Local-Government Consolidation Bill,” Illinois Policy Institute, April 19, 2016. 62 Ben VanMetre, “Make Bankruptcy an Option for Illinois Municipalities,” Illinois Policy Institute, March 11, 2015. 1 Teachers’ Retirement System, Teachers’ Retirement System Actuarial Report 2015, (2015). 2 John Klingner, “State of Illinois’ Pension Debt Jumps to $130 Billion,” Illinois Policy Institute, November 15, 2016. 3 Ted Dabrowski and John Klingner, “Taxpayers Forced to Pay $421 Million More for Teacher Pensions,” Illinois Policy Institute, August 29, 2016. 4 John Klingner, “S&P Downgrades Illinois Credit Rating Closer to Junk,” Illinois Policy Institute, October 4, 2016. 5 Craig Lesner, “Illinois’ $204B Debt Crowding Out Payment for Social Services,” Illinois Policy Institute, November 11, 2016. 6 “State Personal Income,” U.S. Bureau of Economic Analysis. 7 “Median Household Income in Illinois,” Federal Reserve Bank of St. Louis. 8 Illinois Department of Insurance, Biennial Pension Report, 1999, 2015; Illinois Comptroller, Traditional Budgetary Financial Report 1998, 2015. 9 Commission on Government Forecasting and Accountability, Financial Condition of the Illinois State Retirement Systems as of June 30, 2015, (March 2016). 10 “The State Pension Funding Gap: 2014,” The Pew Charitable Trusts, August 24, 2016; Indiana and Wisconsin’s more recent growth in accrued liabilities, 2003 to 2014, was compared with Illinois’ accrued liabilities growth over the longer period of 1987 to 2014. 11 Commission on Government Forecasting and Accountability, Financial Condition of the Illinois State Retirement Systems as of June 30, 2015, (March 2016). 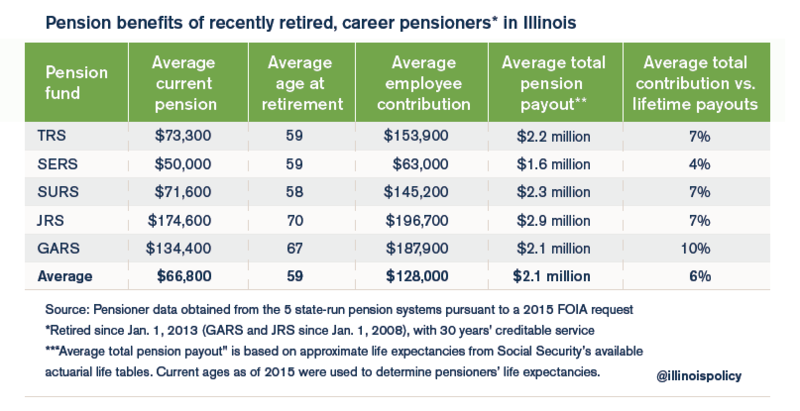 12 Ted Dabrowski and John Klingner, “What’s Driving Illinois’ $111 Billion Pension Crisis: Retirement Ages, COLAs and Out-of-Sync Pension Payouts,” Illinois Policy Institute, April 2016. 13 Commission on Government Forecasting and Accountability, Financial Condition of the Illinois State Retirement Systems as of June 30, 2015. 14 Teachers’ Retirement System, Teachers’ Retirement System Actuarial Report 2016, October 19, 2016. 15 State Universities Retirement System, Actuarial Valuation Report 2015, November 2015. 16 Benjamin VanMetre, “Record Number of Illinois Government Workers Opt Out of Pensions, into 401k-Style Plans” Illinois Policy Institute, September 3, 2014. 17 “Oklahoma Pension Reform: 401(k)-Style Plans for New State Workers,” Illinois Policy Institute, May 31, 2014. 18 Benjamin VanMetre, “7 in 10 Fortune 100 Companies Provide Only Defined Contribution, 401(k) Style Retirement Plans,” Illinois Policy Institute, July 2013. 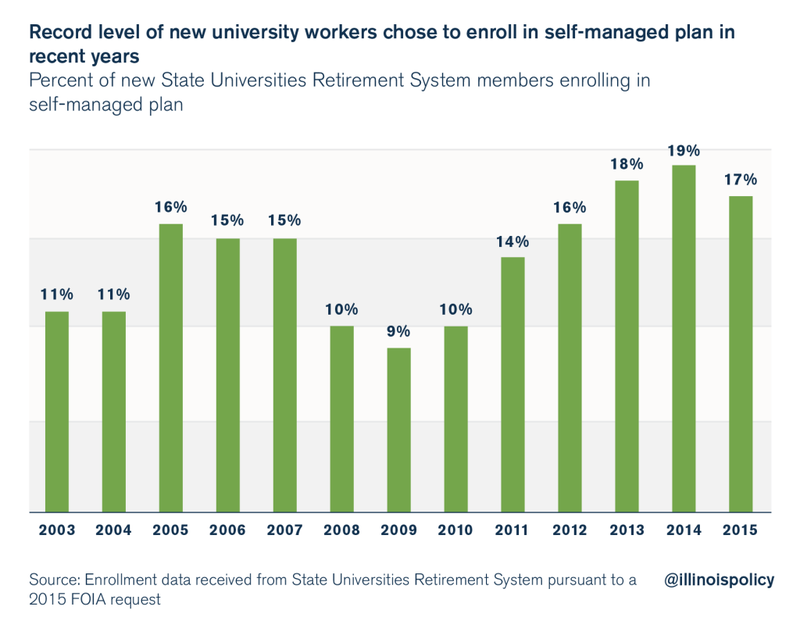 19 State Universities Retirement System, Self-Managed Plan Member Guide. 21 For members of SERS who participate in Social Security, the employee contribution will be 3 percent of salary. Employer contributions will also be 3 percent of salary. 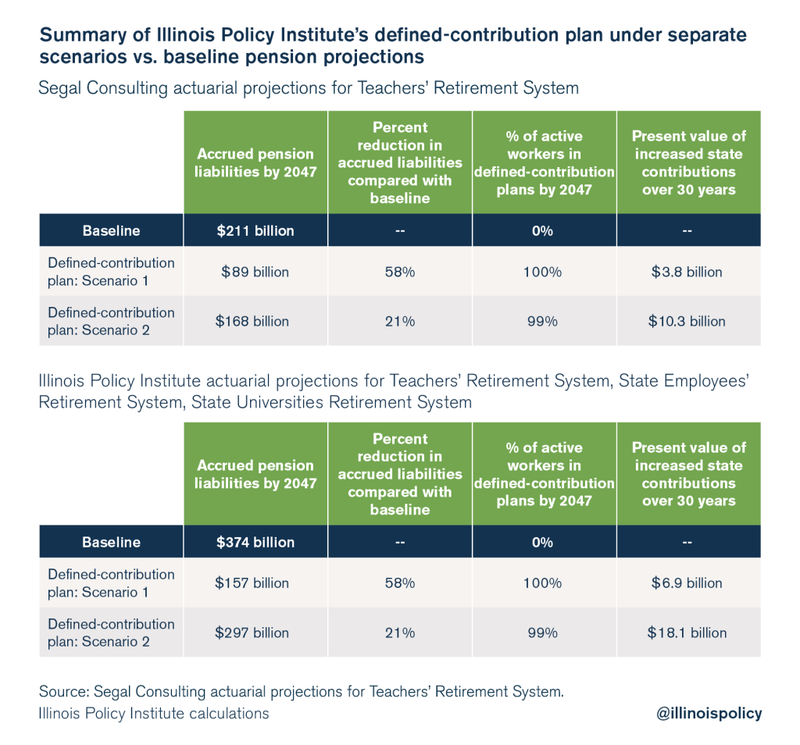 22 The Institute utilized an analysis provided by Segal, the actuary firm that produces pension analysis for the state, which illustrates the effect on the Illinois Teachers’ Retirement System, or TRS, of a 100 percent Tier 2 employee migration to a new, proposed Tier 3 plan. Measures such as actuarial accrued liability, or AAL, and system, assets and annual payments from this analysis were used to extrapolate estimated effects for the state’s two other major pension funds: the State Employees’ Retirement System and the State Universities Retirement System. Based on this methodology, $116.1 billion of TRS AAL accounts for 56.54 percent of the $205.3 billion combined total of the three pension funds. Extrapolating to the other pension funds using this ratio results in annual payments equivalent to 23 percent of estimated general revenue fund expenditures and 50 percent of projected payroll of the three funds. However, AAL decreases $77 billion – a 21 percent reduction – compared with the status quo. General revenue was assumed to grow 3 percent annually. 23 Commission on Government Forecasting and Accountability, Financial Condition of the Illinois State Retirement Systems as of June 30, 2015. 25 Joe McDonald, “Stocks Jump as Dow Closes at Record High,” USA Today, December 5, 2016. 26 Commission on Government Forecasting and Accountability, Special Pension Briefing, November 2016. 28 Teachers’ Retirement System Actuarial Report 2015. 30 Teachers’ Retirement System Actuarial Report 2015. 31 Includes the proposed five-year phase-in of actuarial changes. 1 Michael Lucci, “June Jobs Report: Illinois Workforce Shrinks by 36,000, Working Age Adults Leaving the State,” Illinois Policy Institute, July 2016. 2 Lisa Schencker, “Illinois’ Obamacare Plans Seek Big 2017 Premium Hikes,” Chicago Tribune, August 2, 2016. 3 State AFSCME workers employed under the governor’s pervue, membership data received from Department of Central Management Services pursuant to a 2016 FOIA request. 4 Letter from Gov. Bruce Rauner to All State Employees, January 15, 2016. 5 Mailee Smith, “AFSCME’s Demands Come at Expense of Neediest Illinoisans,” Illinois Policy Institute, October 15, 2016. 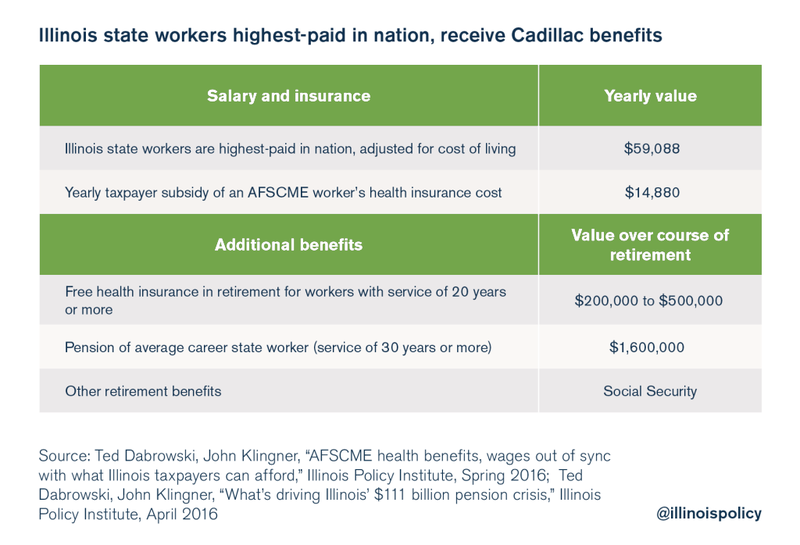 6 Ted Dabrowski and John Klingner, “Cadillac Benefits: Illinois State Workers Highest-Paid in Nation,” Illinois Policy Institute, May 27, 2016. 11 Mailee Smith, “A Comprehensive Review of the Most Absurd Benefits in the AFSCME Collective Bargaining Agreement,” Illinois Policy Institute, Summer, 2016. 17 Commission on Government Forecasting and Accountability, Special Pension Briefing, (November 2016). 1 State of Illinois Fiscal Year 2017 Operating Budget. 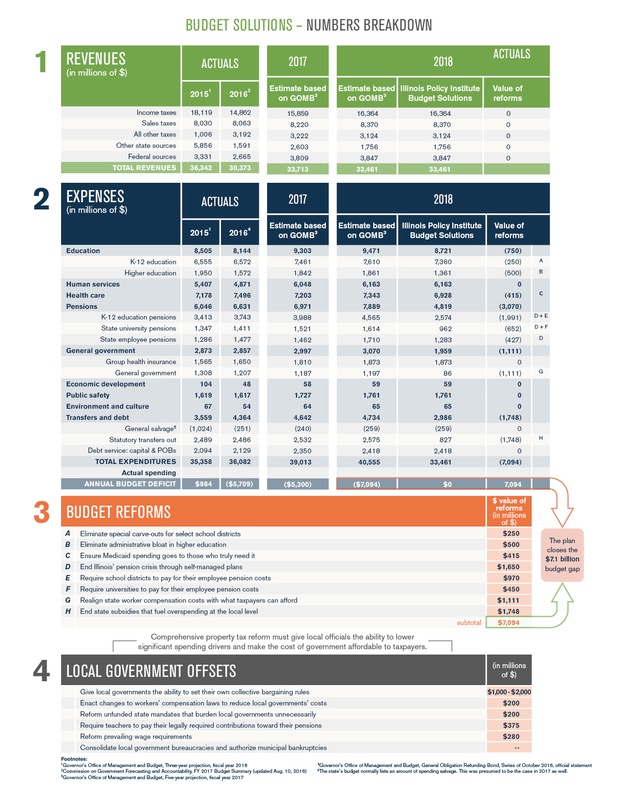 2 “Fiscal Year 2017 Budget Overview,” Illinois Department of Healthcare and Family Services. 3 Merritt Hawkins, 2014 Survey Physician Appointment Wait Times and Medicaid and Medicare Acceptance Rates. 4 Daniel R. Levinson, “Access to Care: Provider Availability in Medicaid Managed Care,” Department of Health and Human Services, Office of Inspector General, December 2014. 5 Carolyn Y. Johnson, “More Evidence Expanding Medicaid Increases Emergency Room Visits,” Washington Post, October 19, 2016. 6 Lisa Schencker, “State Switches Stance on Hepatitis C Drugs, Expands Access, But Not All Medicaid Patients Qualify,” Chicago Tribune, September 12, 2016. 7 Avik Roy, “Oregon Study: Medicaid ‘Had No Significant Effect’ on Health Outcomes vs. Being Uninsured,” Forbes, May 2, 2013. 8 Governor’s Office of Management and Budget, Governor’s Recommended Fiscal Year 2017 Budget, 2016. 12 John Daniel Davidson, “How States Could Transform Medicaid with a Block Grant,” National Review, October 7, 2015. 13 Naomi Lopez Bauman, “Improve Health Care for Medicaid Patients While Controlling Costs for Taxpayers,” Illinois Policy Institute, 2015. 14 “Medicaid Expansion in Michigan,” The Henry J. Kaiser Family Foundation, January 8, 2016. 15 “Periodic Redeterminations of Medicaid Eligibility,” 42 CFR 435.916. 16 Jonathan Ingram, “Medicaid 59: A Detailed List of Reforms,” Illinois Policy Institute, May 21, 2012. 17 “State Medicaid Agencies Can Significantly Reduce Medicaid Costs for Durable Medical Equipment and Supplies,” Department of Health and Human Services, September 2015. 18 Jonathan Ingram, “Illinois Medicaid Expansion Enrollment at Nearly Double Original Projections,” Illinois Policy Institute, September 11, 2015. 19 “Fiscal Year 2017 Budget Overview,” Illinois Department of Healthcare and Family Services, February 17, 2016, at 10. 20 Don Sadler, “The Ins & Outs of Ambulatory Surgery Centers,” OR Today, November 1, 2014. 1 Ted Dabrowski and John Klingner, “Pensions vs. Higher Education,” Illinois Policy Institute, February 2016. 9 Dawn Rhodes, “Only 86 Freshman at Chicago State University, As Total Enrollment Drops 25 Percent,” Chicago Tribune, September 27, 2016. 11 College Board, Trends in Higher Education 2016, Excel data file, table 6. 14 Payroll estimate based on $4.716 billion annual payroll cost for fiscal year 2018, as provided in Commission on Government Forecasting and Accountability, Illinois State Retirement Systems, Financial Condition as of June 30, 2015.